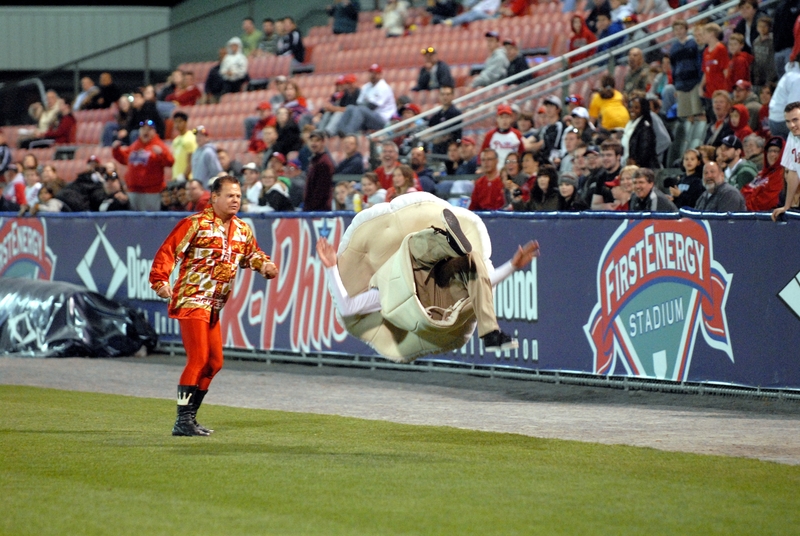 From 50-50 raffles to jersey auctions to rappelling mascots, Minor League teams are well-versed in the art of raising money for charity. 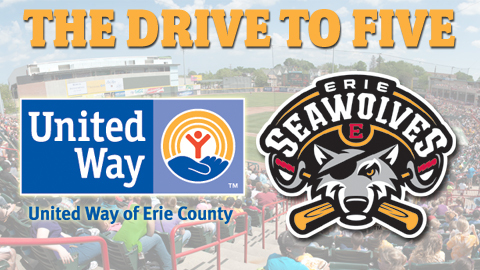 And, lately, some teams have taken their philanthropic endeavors in bold new directions. 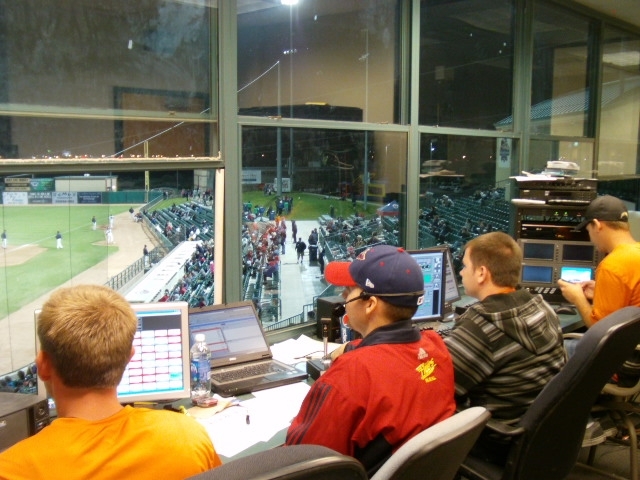 You’ve been warned: the moniker “River Cats” is comprised of two words, with a capital “R” and a capital “C.” Effective immediately, all members of the local and national media, River Cats corporate partners, full- or part-time River Cats staff, and season, flex, and mini-plan ticket holders will be fined $1 for spelling “River Cats” incorrectly. 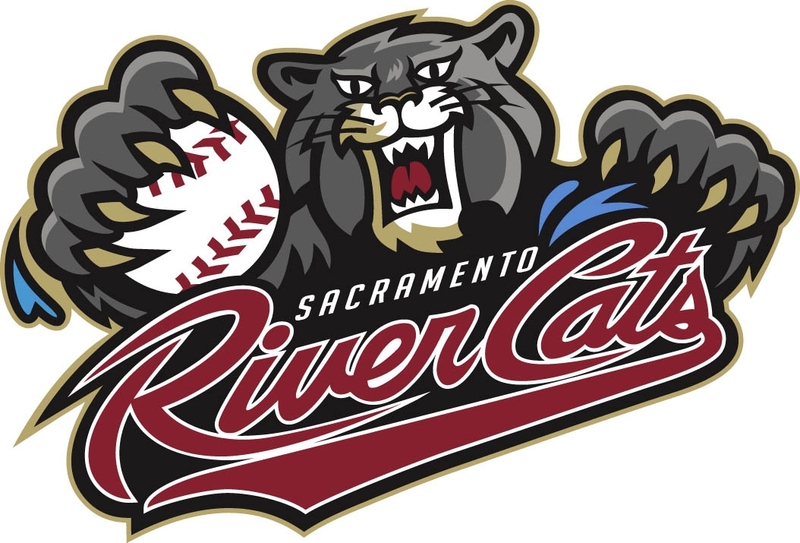 All money collected will go to the River Cats Foundation, which has contributed more than $1.5 million in cash and $16.2 million in in-kind donations to the greater Sacramento community since 2000. 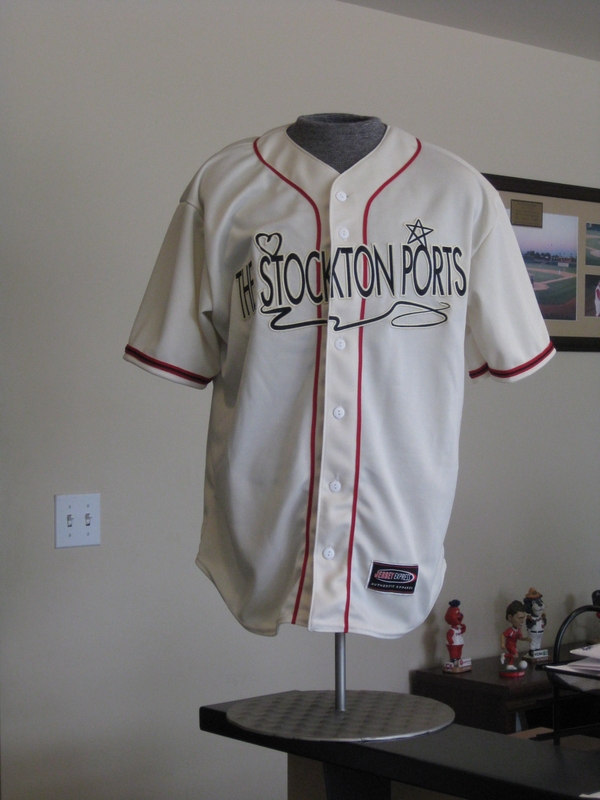 The River Cats’ initiative brings up a larger issue, in that there is a complete lack of uniformity when it comes to Minor League monikers. 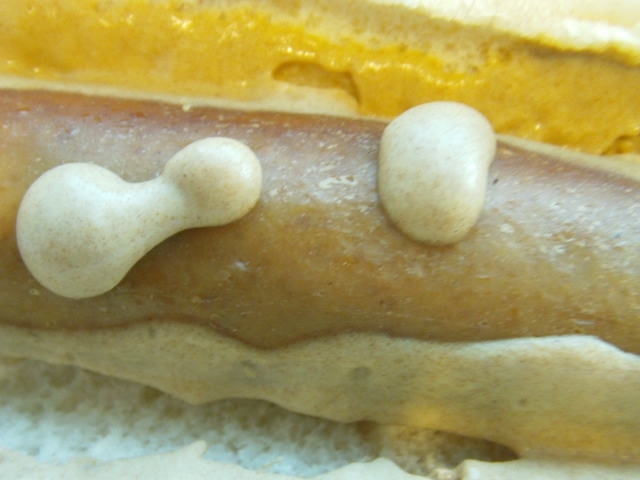 The Charleston RiverDogs do not use a space between River and Dogs, for example, while the Delmarva Shorebirds go the one word, no caps route. 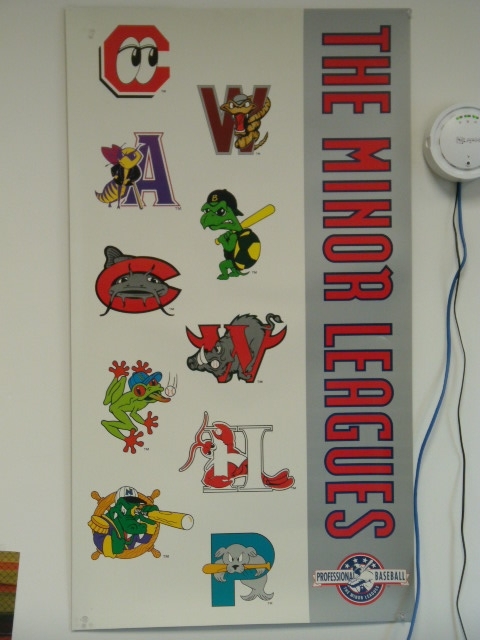 The Minor Leagues are a grammatical minefield, their team names as unregulated as a 19th century western territory brothel. 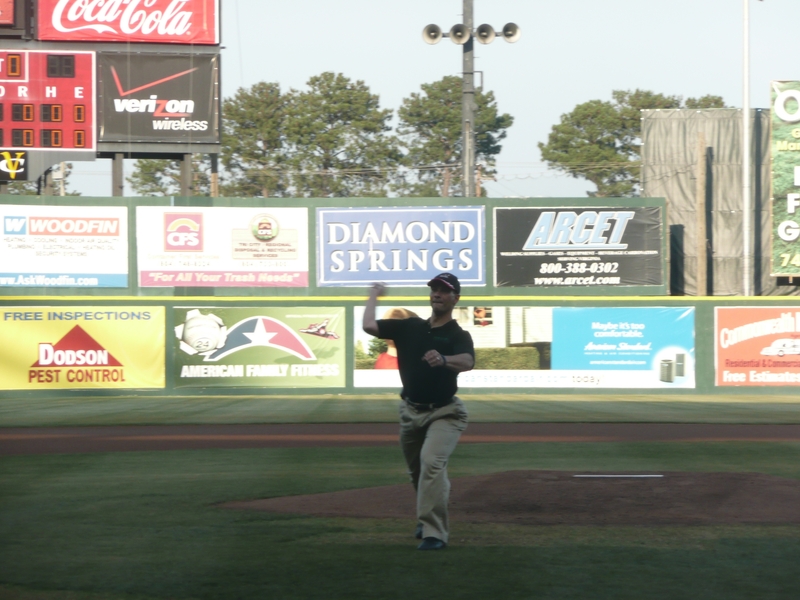 Another unique fundraising effort comes courtesy of the Greensboro Grasshoppers, who partnered with outbid.com in order to host a live online auction featuring team owner Donald Moore as auctioneer. Outbid is said to “combine the theater and transparency of live online auctions with social gaming features,” and its existence means that we are all one step closer to living in a Utopian society. 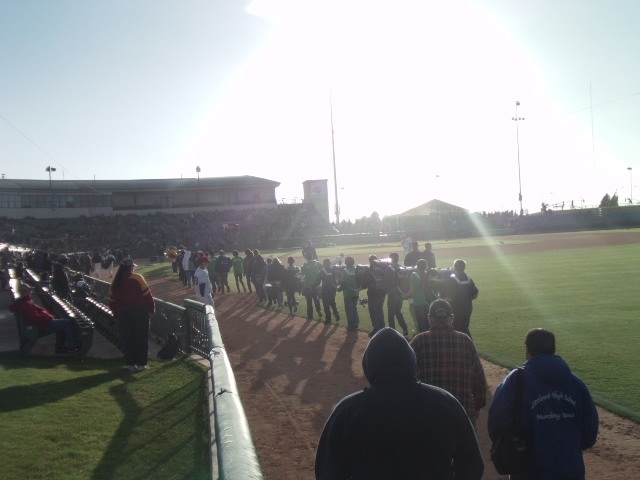 Items that the Grasshoppers auctioned off included team-autographed baseballs, a night in a 24-person ballpark suite and, best of all, an autographed Willie Nelson jersey. 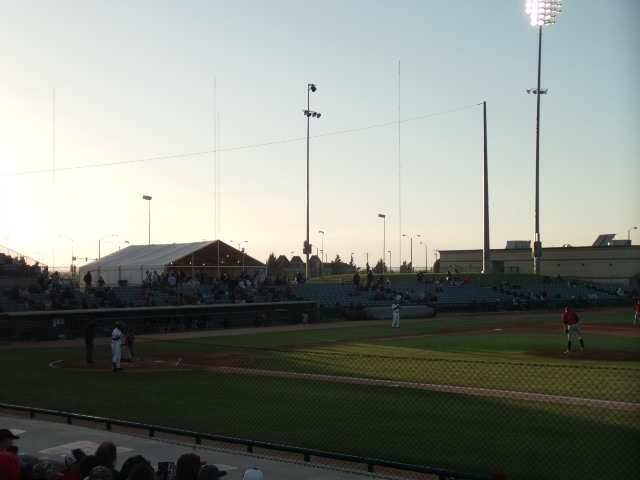 Finally, we turn our attention to the Lancaster JetHawks (who, it should be noted, recently had to postpone one of their games due to a haboob). 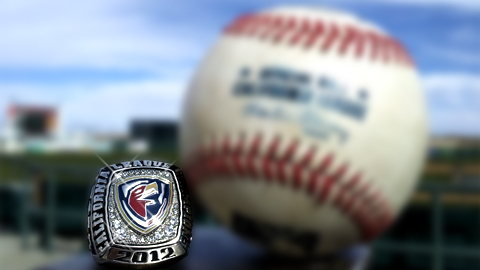 The JetHawks won the California League championship last season, and now fans are being given the chance to get a ring. 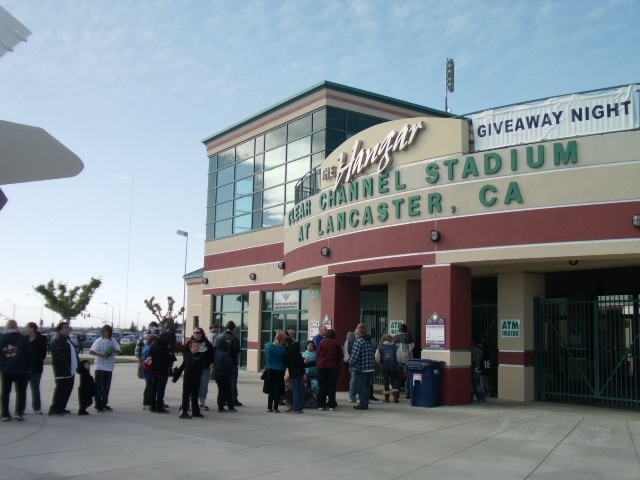 The Lancaster JetHawks have partnered with two local little leagues to host a special raffle giving two individuals the opportunity to win an authentic customized 2012 California League Championship Ring. 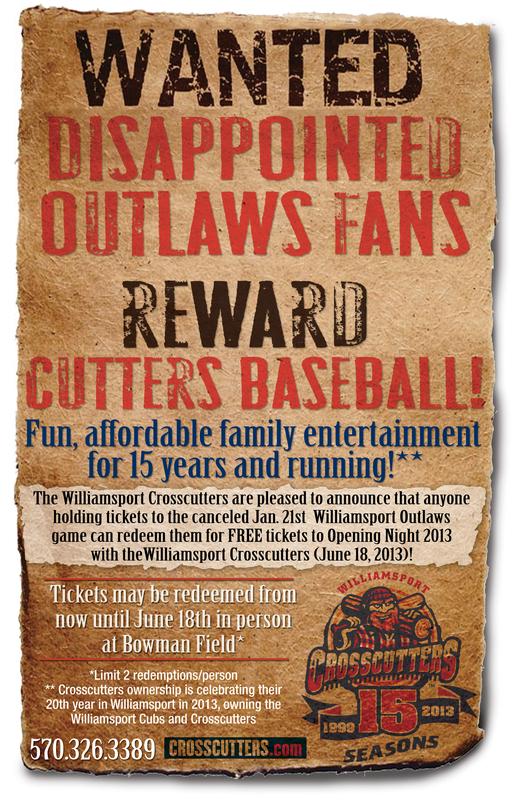 Proceeds from the raffle will be donated to West Lancaster and Quartz Hill Little Leagues. Raffle tickets are on sale now and will be sold through June 10. 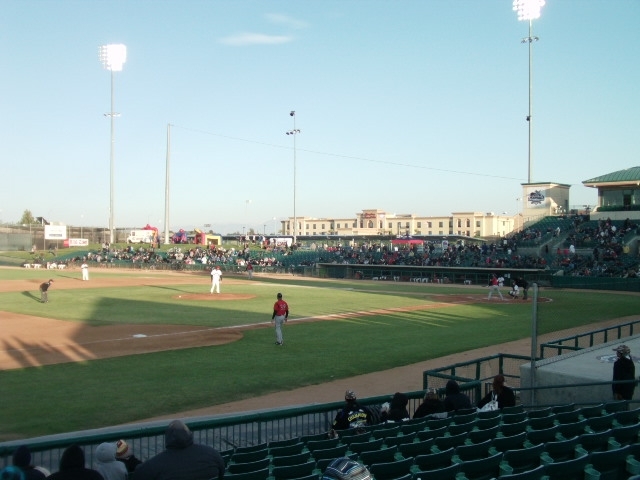 Tickets will be available for $5 each, or five for $20….The winning raffle tickets will be drawn just prior to the JetHawks game on June 12. 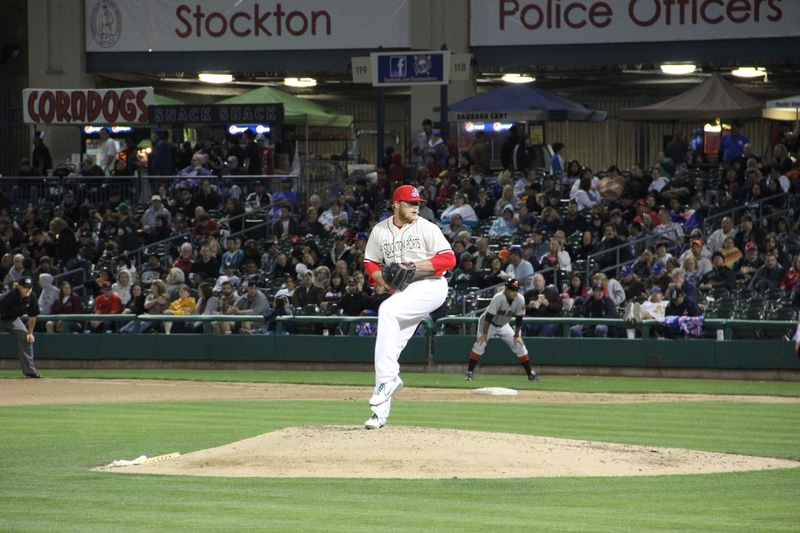 The two winners will receive custom-made rings personalized with their own last name during a special pre-game ceremony that will take place at a JetHawks game in late August. And that shall conclude this blogging week, which was admittedly a light one. 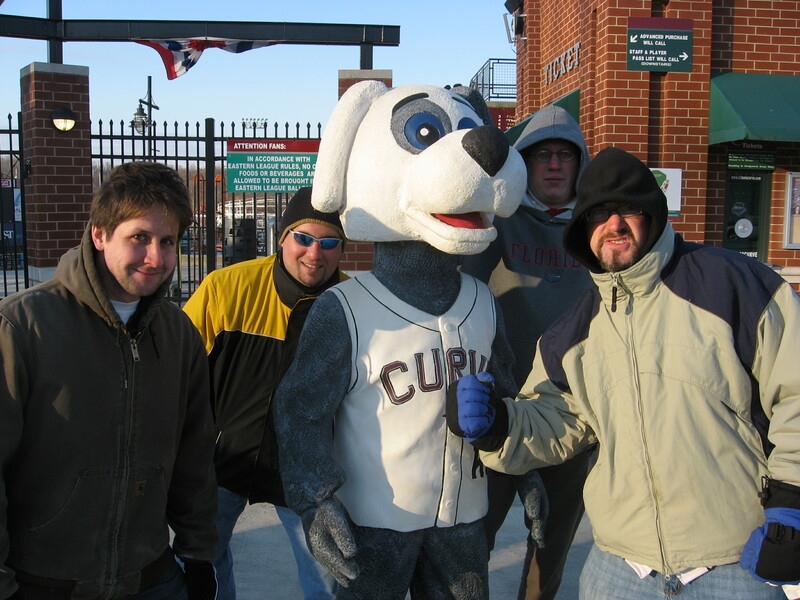 And when things are light on the blog it’s always a good bet that they’re correspondingly heavy over on MiLB.com Head to the site for Promo Preview, an Opening Weekend Crooked Numbers column, and three — count ’em three — pieces of content related to 42. I do it all for you, as “you” is what I have nicknamed my paycheck. 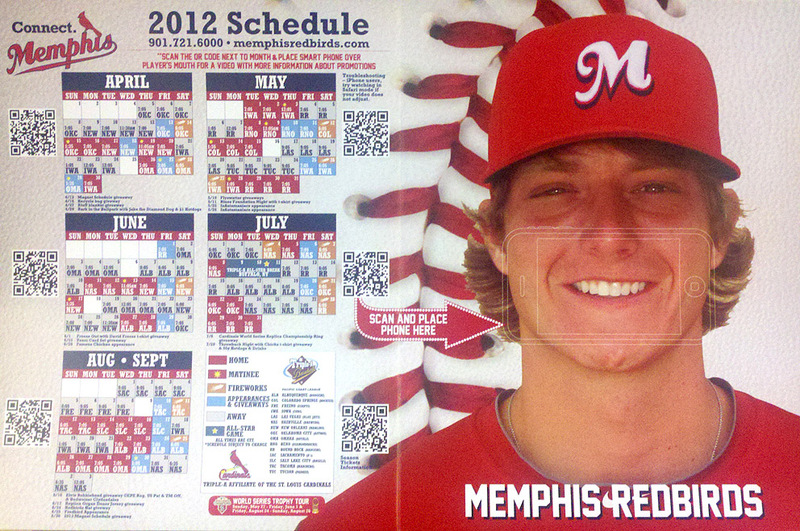 It’s Opening Day 2012, and my reaction regarding the start of a new baseball season is the same as it is every year. 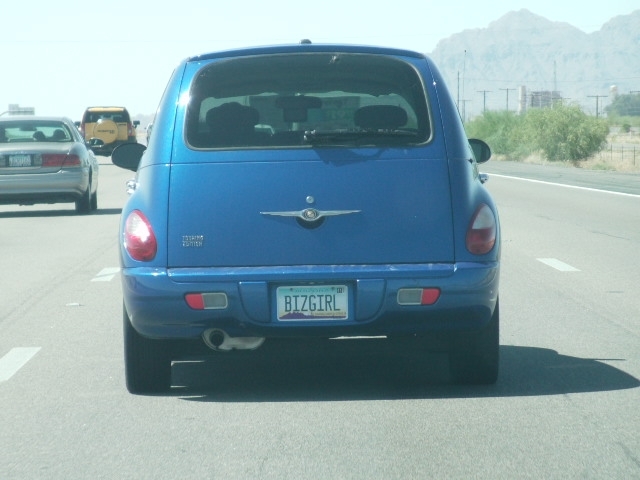 Four words says it all, and then some. 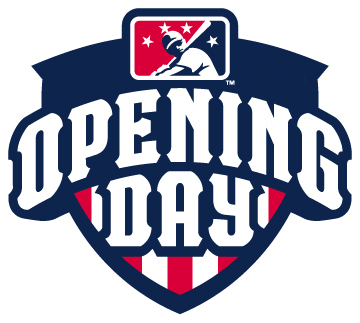 I would GREATLY appreciate it if someone could take the audio from the clip linked to above and lay it over an array of upbeat Minor League images, ending with the Opening Day 2012 logo. I’m serious. This is, if not a game changer, then at least a game modifier (I’d also accept “alterer”). As you can see in the above photo, fans can place their SmartPhones over Shelby Miller’s mouth in order to watch a video highlighting upcoming promotions. I’d tell you about said video, excepting my phone is defiantly stupid. It doesn’t even have the number 5. 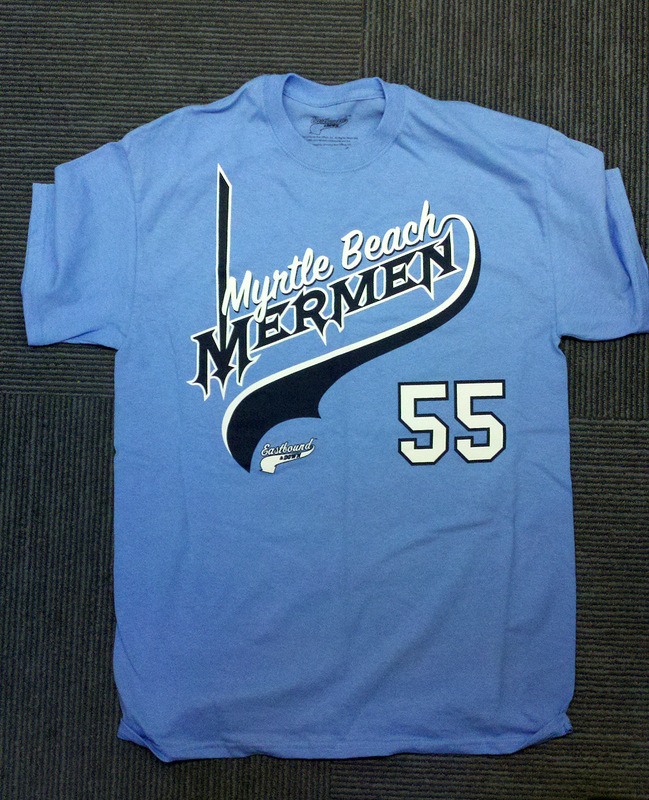 Meanwhile, a “Myrtle Beach Mermen” shirt arrived courtesy of Die Hard Threads. 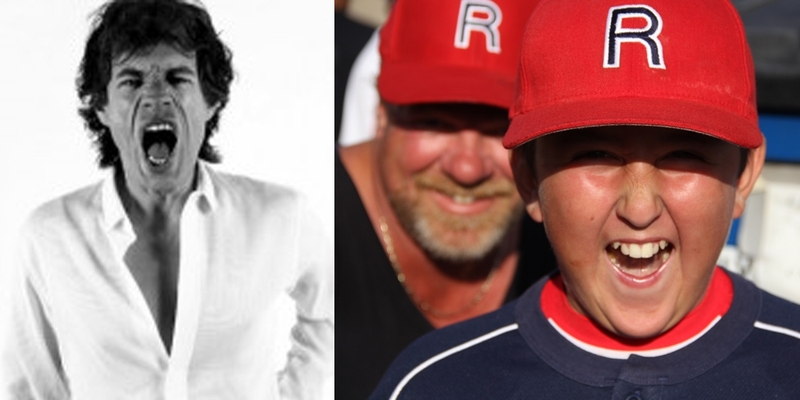 Believe it or not, I have yet to watch Eastbound and Down. 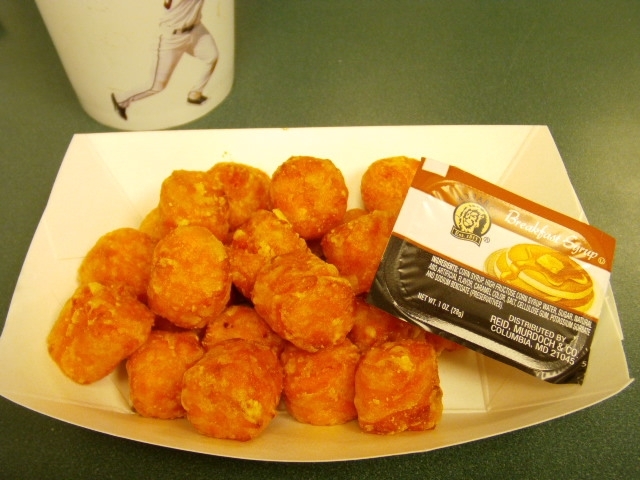 (Most of my television time has been spent lobbying Sony to release the rest of Mary Hartman Mary Hartman on DVD.) 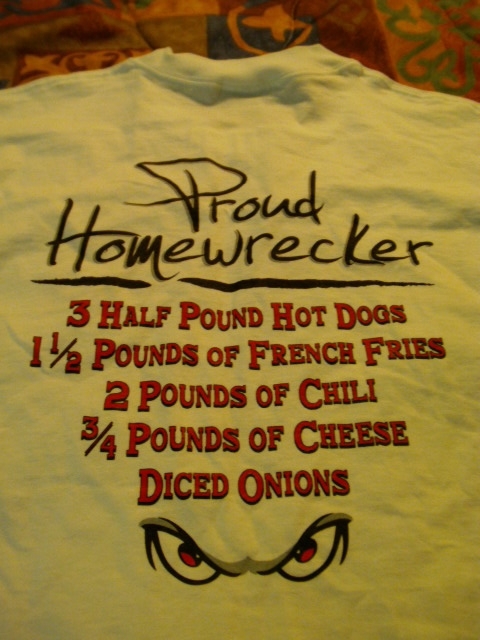 But the shirt is pretty cool, is it not? 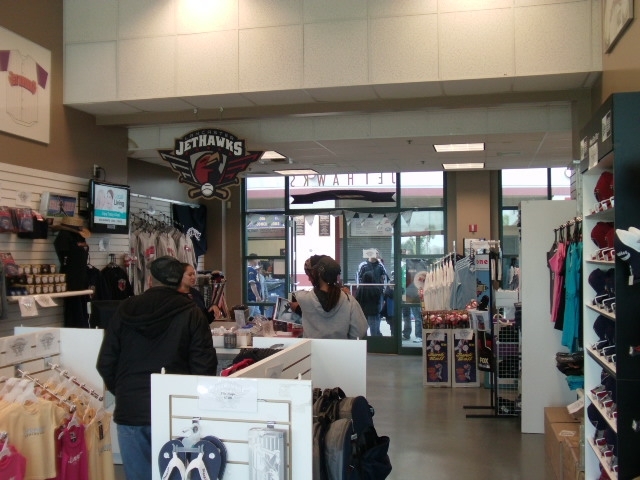 Let’s close this Opening Day missive with a pair of items from our high-flying friends in Lancaster, CA — the JetHawks. 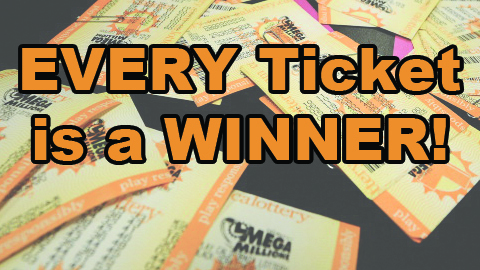 In the wake of last Friday’s mega-sized Mega Millions drawing, the team decided to make winners (of sorts) out of the losers. 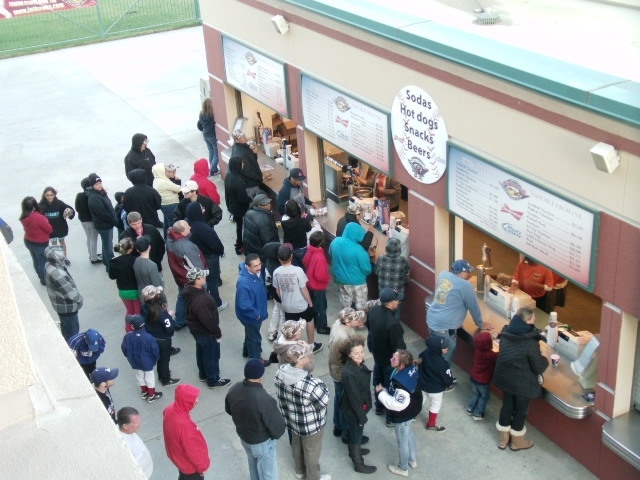 Starting Saturday from 11am to 2pm, fans can bring losing lottery tickets to the Clear Channel Stadium box office and receive a $2 discount on any April 12 Opening Day ticket in any section. 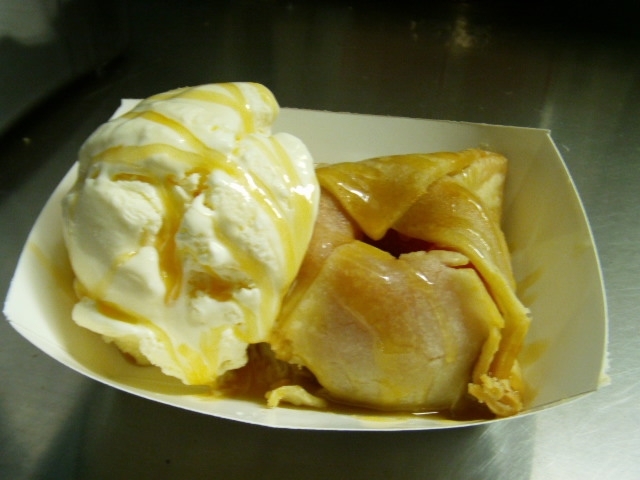 If you can’t make it on Saturday, the discount will be available April 2-6 from 9am to 5pm. 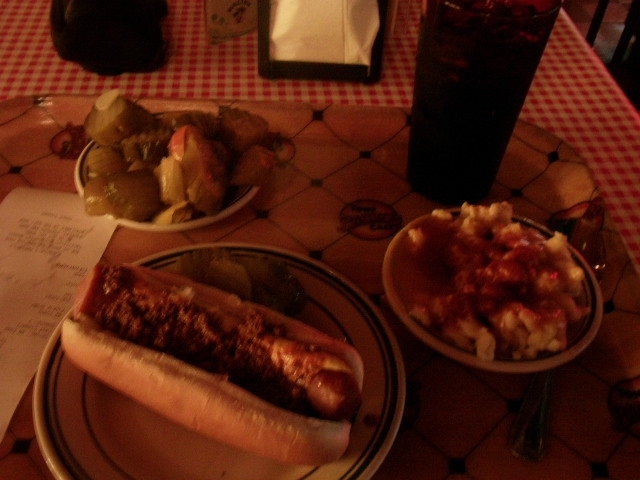 And with that, a cut and pasted food description, I conclude my first post of the 2012 season. There’ll be plenty more where that came from. Me: Today I have a really big news item to share with all of you. You: Well, how big is it? Look, I don’t know why you’re confused. 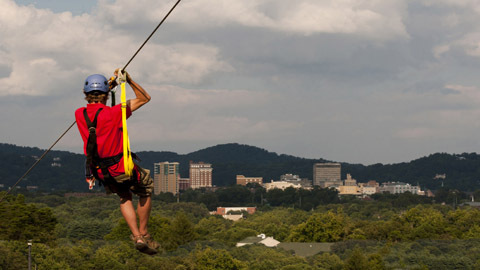 I really do have a 3600-foot news story to share. 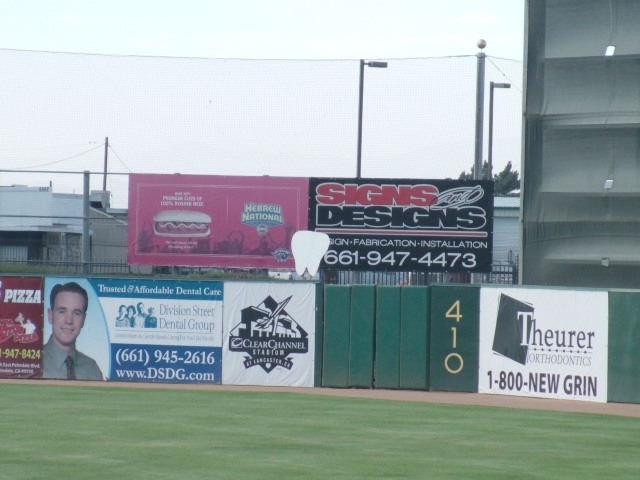 The scoreboard will be the largest HD board in minor league baseball at 3600 square feet (60’ X 60’). The current largest belongs to the Buffalo Bison, standing 80’ x 33’ (2640 square feet). 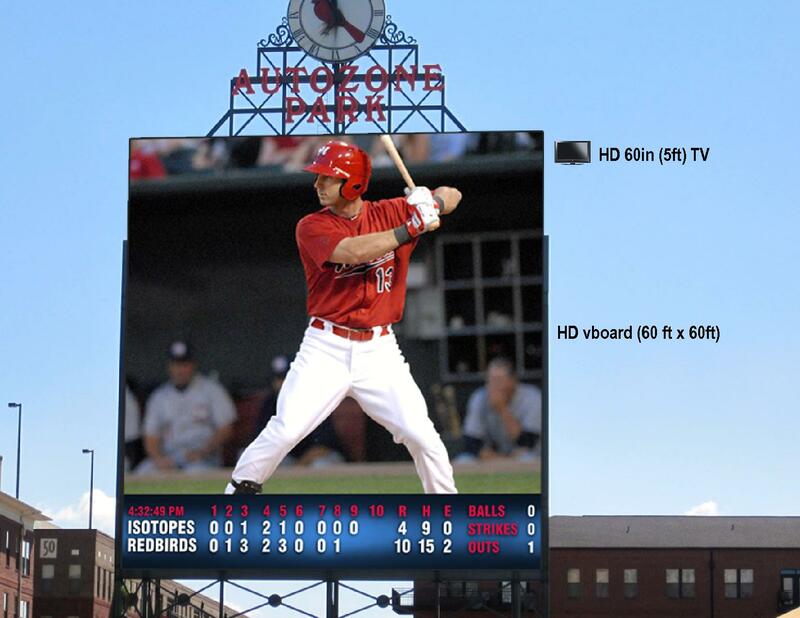 The Redbirds video board also beats several of the NFL team boards installed by Daktronics. 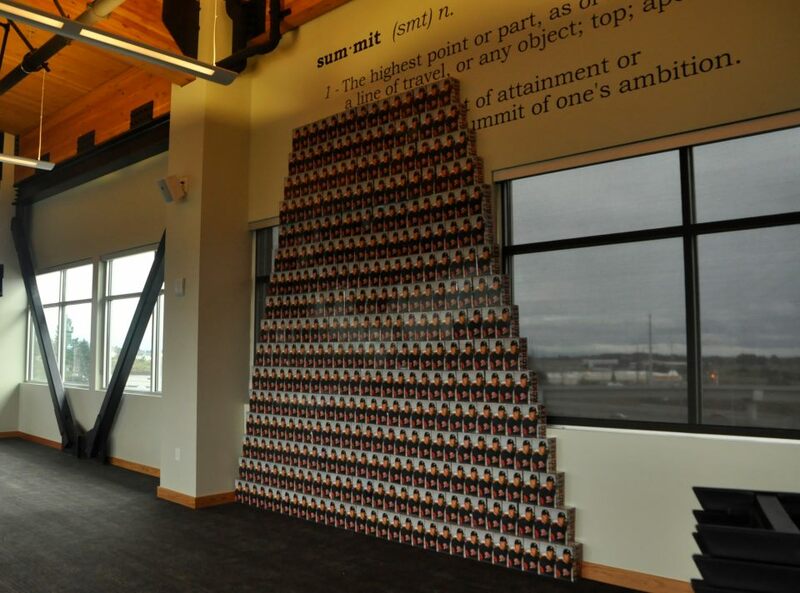 The board is made up of 1,440,000 pixels and weighs over 20 tons. Indeed, it was just last season that the Bisons’ laid claim to the oft-contentious title of “biggest scoreboard in Minor League Baseball,” but it now appears that the Redbirds are wresting it from them. But for how long? There’s always someone out there lurking, just waiting for that opportunity to claim the throne. For now, however, pixellated supremacy belongs to Memphis. Let’s move on from big news to old news. 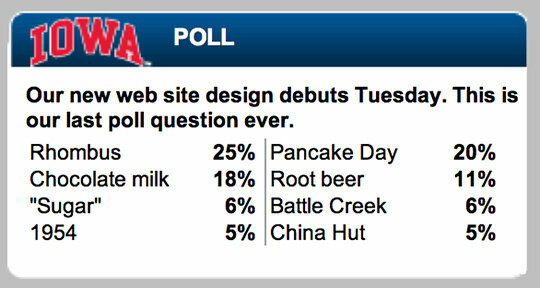 In fact, this is some of the oldest news I’ve ever had the pleasure of reporting. 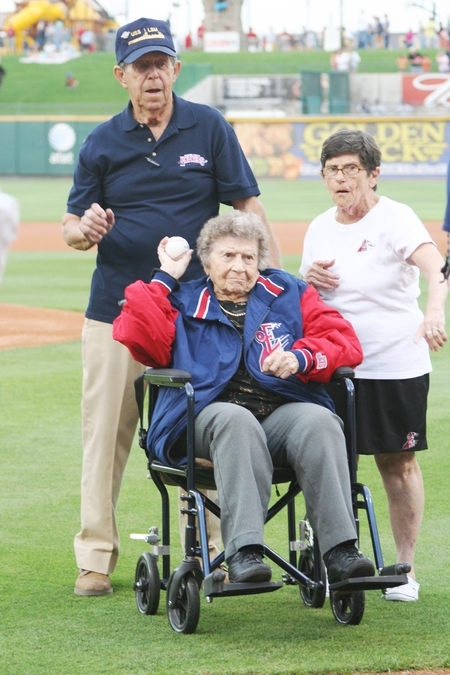 Regular readers of this blog are well aware that each of the past two Minor League seasons have included a centenarian first pitch. 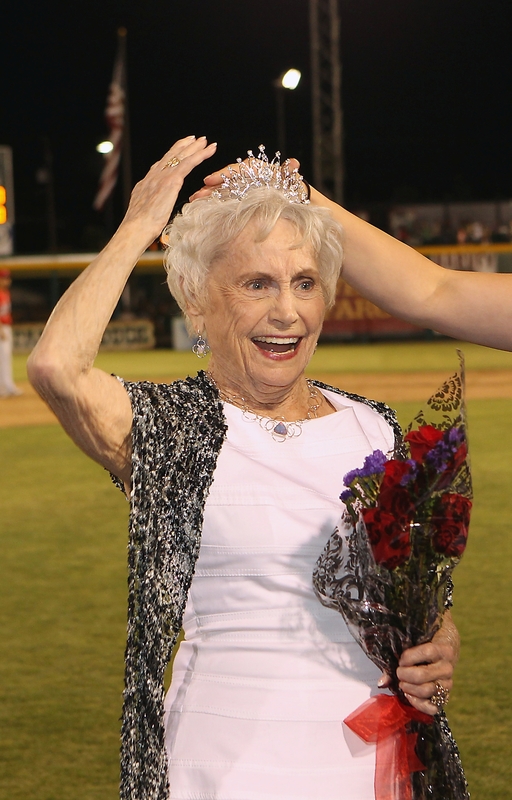 In 2010, 102-year-old Chris Nocera fired a strike for the Round Rock Express. 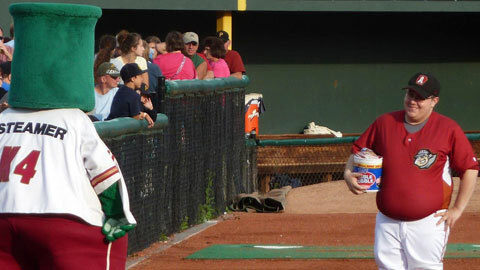 Then, last season, 109-year-old Violet Smith threw one down the middle prior to a Great Lakes Loons game. 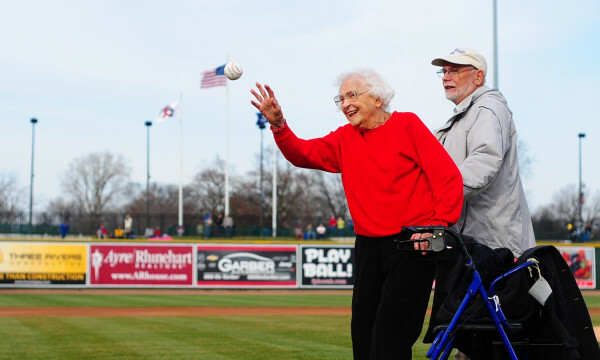 But 2012 will usher in a new age of elderly first pitches: that of the supercentenarian! 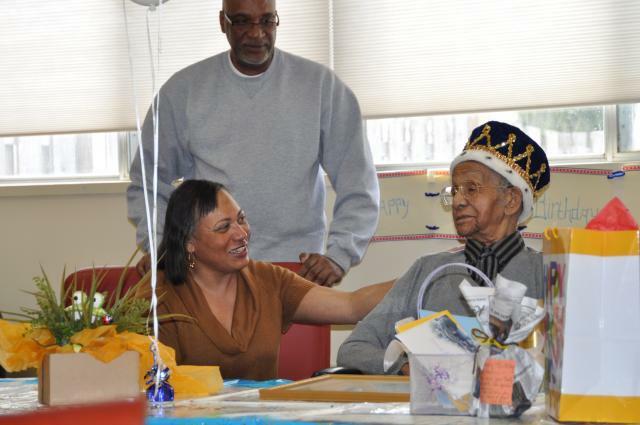 On March 31, Shelby Harris of Rock Island, IL will turn 111 years old. 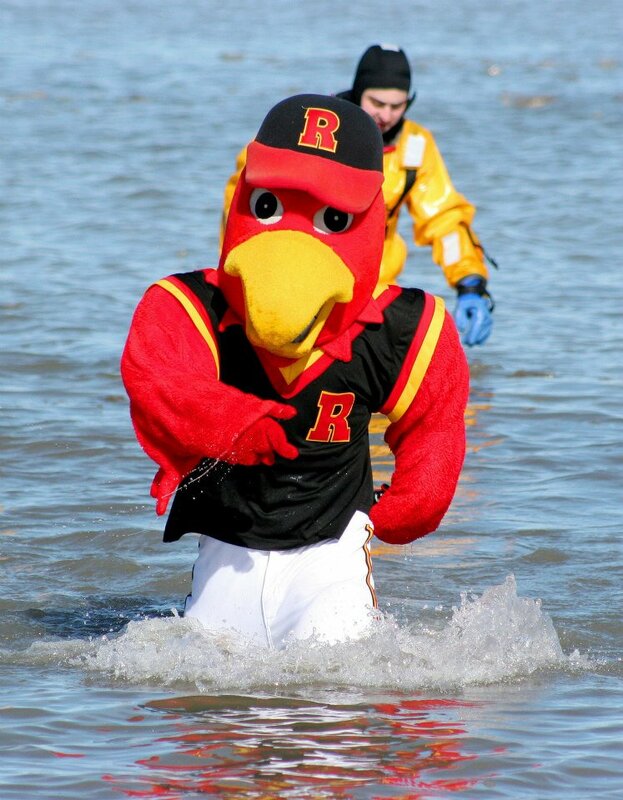 Five days later, he’ll throw out the first pitch at the Quad Cities River Bandits home opener! 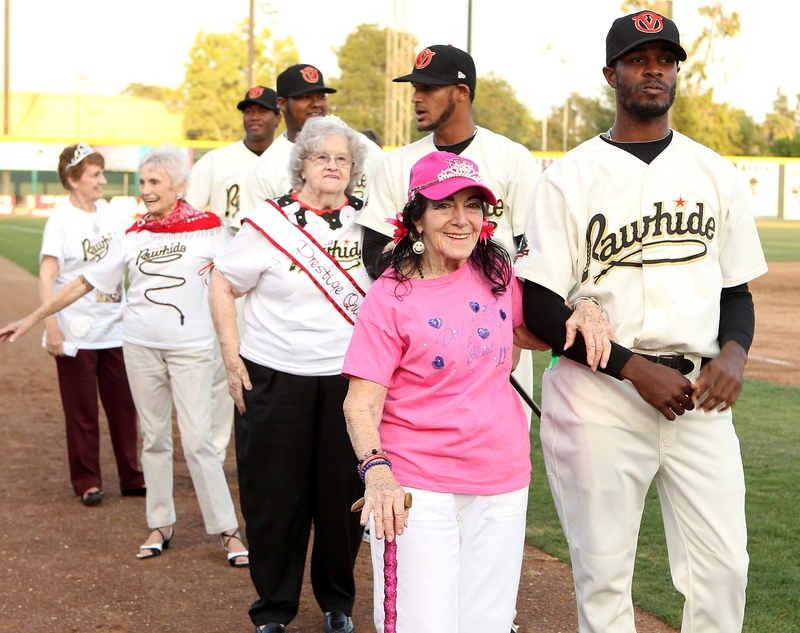 Harris is the oldest man in America, and it’s fantastic that the River Bandits have extended the invite and that he’s in good enough shape to do it. 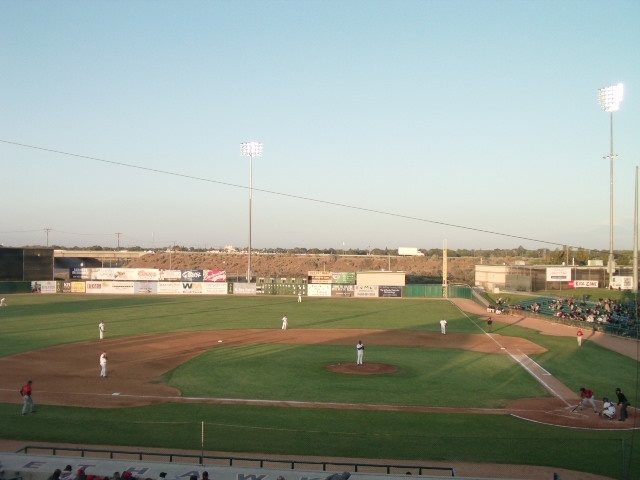 The Lancaster JetHawks, a Houston Astros affiliate in the state of California, have put together a promotion inspired by the exploits of a Colorado quarterback who first made a name for himself in Florida. 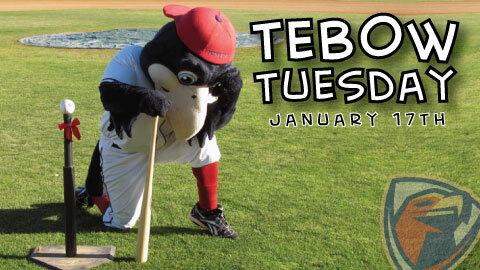 After last weekend’s thrilling overtime victory against the heavily favored Pittsburgh Steelers, [JetHawks mascot] KaBoom has convinced the JetHawks Front Office to put together a special “Tebow Tuesday” Promotion that gives JetHawks fans the opportunity to buy 15 tickets for only $15. The Tebow Tuesday Promotion will activate if the Denver Broncos can pull off another upset this weekend against the New England Patriots. 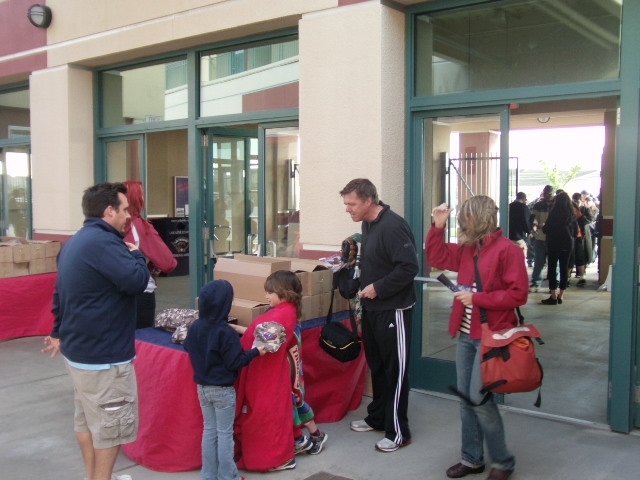 The package will only be available next Tuesday, January 17, and includes 15 undated ticket vouchers for any JetHawks home game in April. 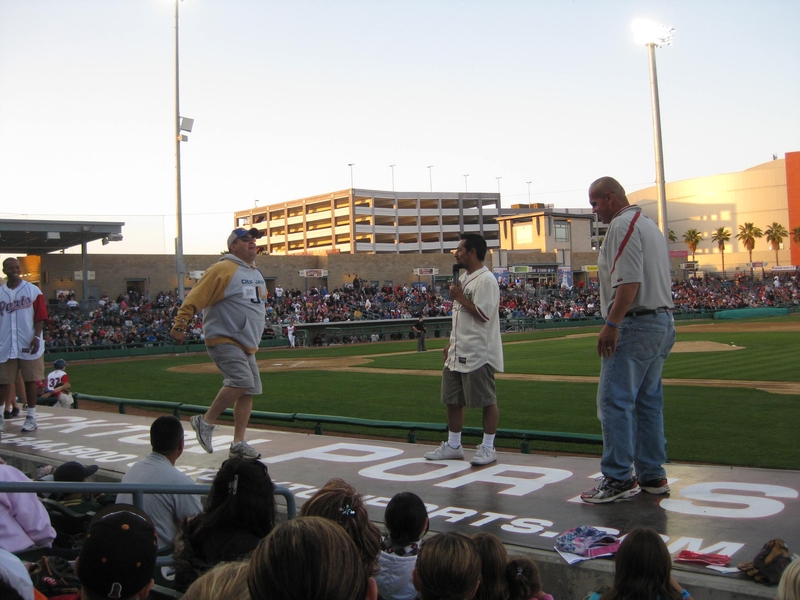 In addition, any fan who wears their Tim Tebow Jersey to the Tuesday, April 17, game against the High Desert Mavericks will have the opportunity to throw out a ceremonial first pitch and take a picture “Tebowing” with KaBoom on the field prior to the game. 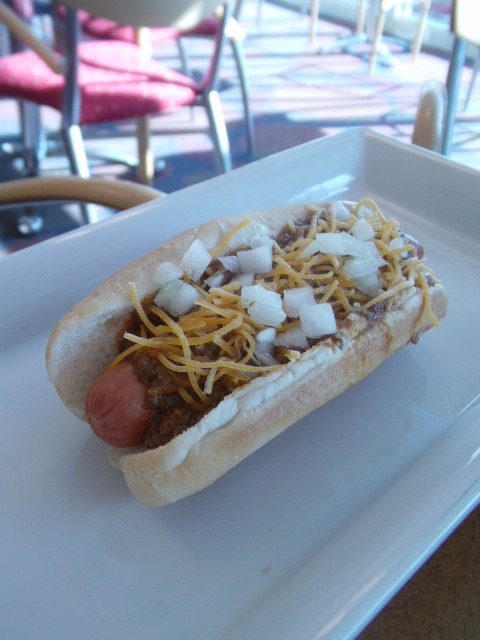 And now, apropos of nothing, let’s end with a photo. 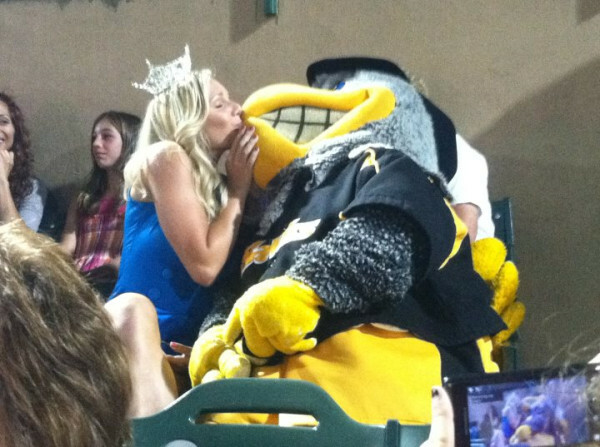 This shot depicts one of the perks of being a mascot: being on the receiving end of sensuous acts initiated by Miss America contestants. 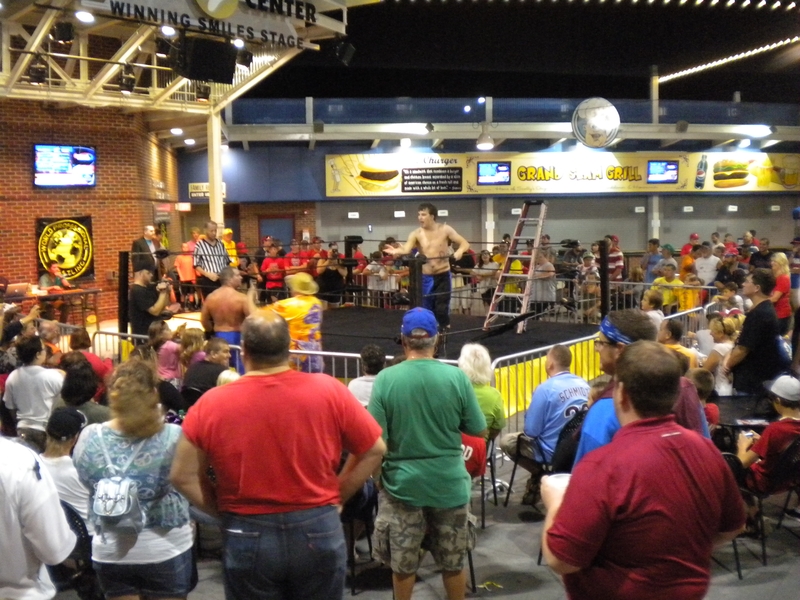 Last year, Jerry Lawler visited Reading’s FirstEnergy Stadium and delivered a devastating clothesline to a foolhardy cauliflower. 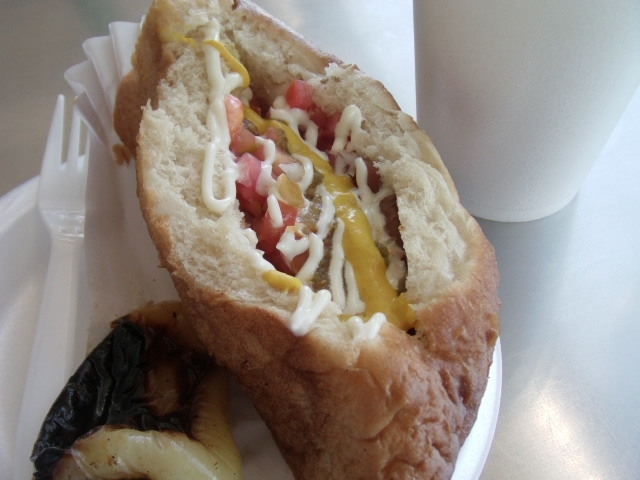 You may recall the image, seeing how it was indelible. This year’s notable wrestling guest was Sunny, famed diva and member of the WWE Hall of Fame. And this time, the clothesline victim was Evil Candy (a longtime nutritional adversary of Cauliflower). 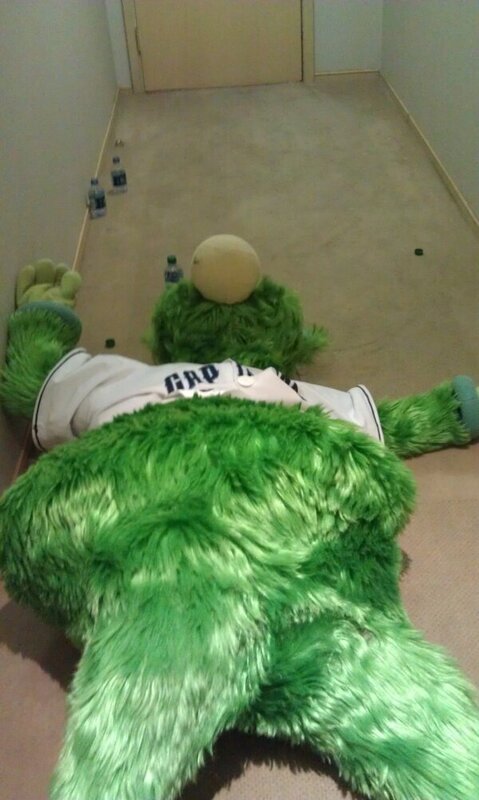 Prior to the game, Sunny and the Blue Meanie visited the R-Phils’ clubhouse. This picture is disintegrating right before our eyes, a reminder of life’s ephemeral nature. 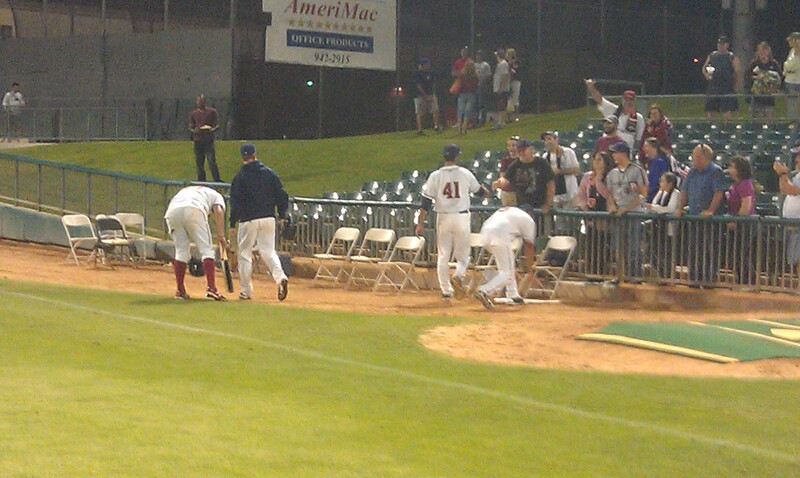 While in the locker room, Sunny must have taken a liking to R-Phils backstop Tim Kennelly. 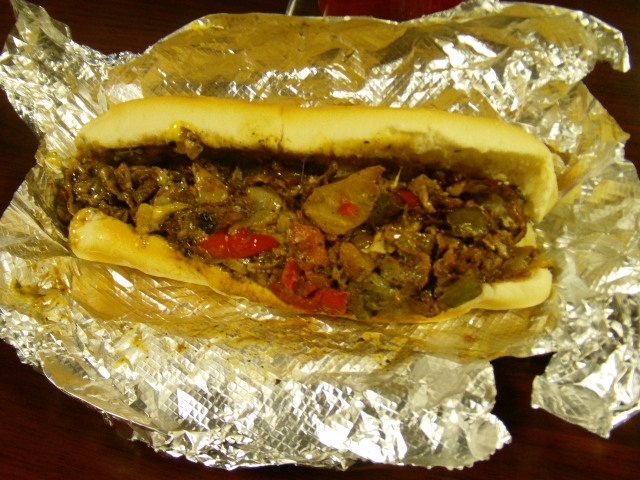 In a post-game interview with R-Phils director of media relations Tommy Viola, Sunny refers to the “so-cute” Kennelly as her “future ex-husband” and expresses a desire for some personal coaching (the Blue Meanie, meanwhile, reveals himself to be a fan of Matt “Roast Beef” Rizzotti). 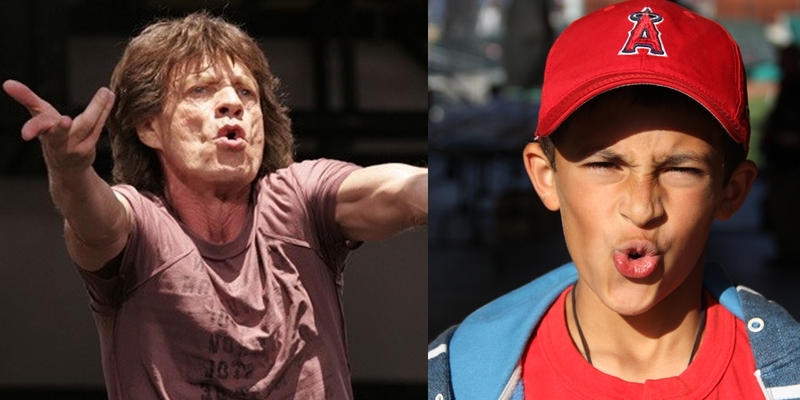 And, quite fittingly, this star-studded “Tribute to Wrestling” featured some actual wrestling. 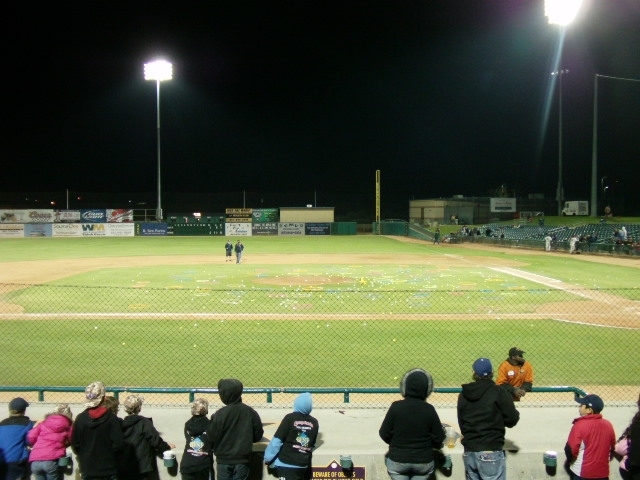 This was the ballpark scene after the game. 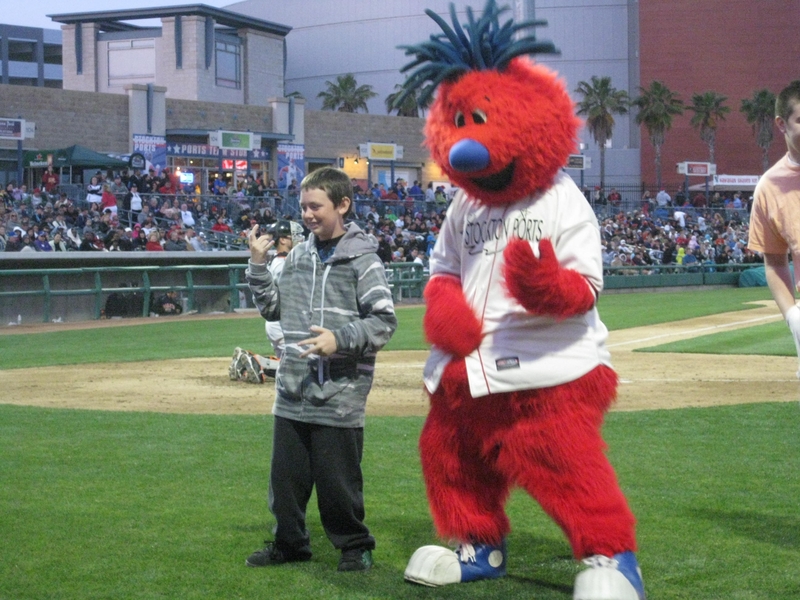 And since we’re on the topic of “2011 incarnations of promotions I also covered in 2010”, it is worth noting that the Modesto Nuts have once again staged a “Mascot Dance Party” featuring the inimitable Al and Wally. Last season, Al was the lucky recipient of a one-on-one lesson with dance instructor Taelor Fernandez. This year, it was Wally’s turn to learn from the beautiful Ms. Fernandez. Those lessons have really paid off. And since we’re on the topic, you should really be aware that a new bat dog-based dance craze is sweeping through Trenton. Teach me how to Derby! 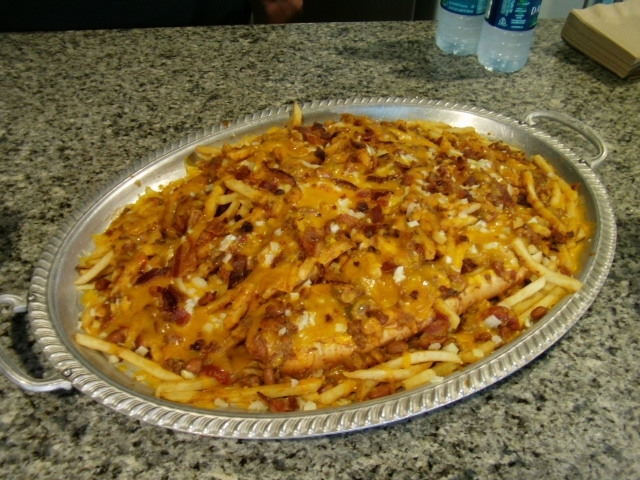 But if those moves are too complicated, then maybe you should check out what’s on offer out there in Lancaster, CA. 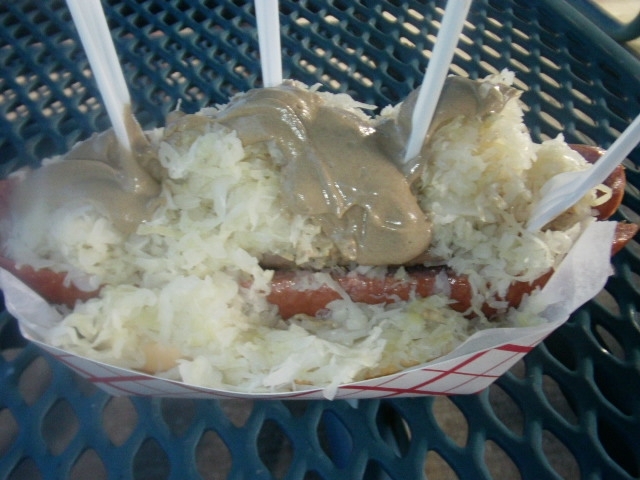 Whip it good! All this dancing is making me realize that I need to up my game, as the only move I ever mastered was limping to the side like my leg was broken. Please help me, Taelor Fernandez. 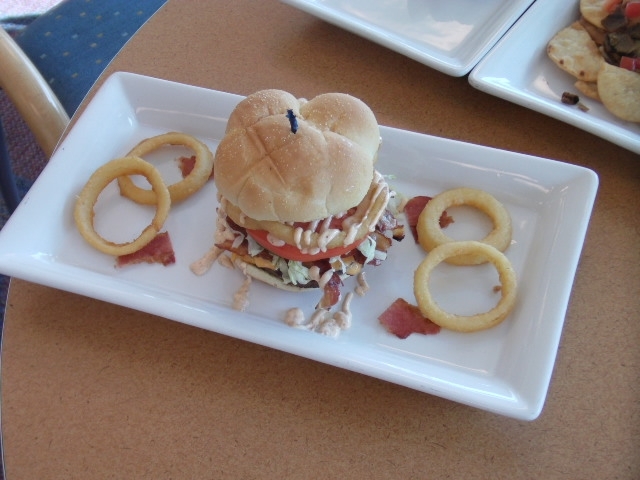 When I was in Lancaster earlier this month, JetHawks food and beverage director Adam Fillenworth told me that the team was on the cusp of debuting “the smallest hamburger in Minor League Baseball. 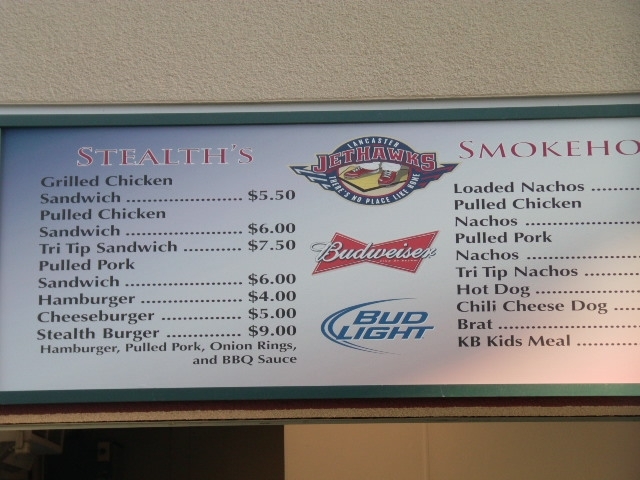 Such an item would be a tongue-in-cheek rebuttal to the “extreme” concessions that have overtaken the Minor League landscape in recent years, a trend that the JetHawks themselves have participated in (see Burger, Stealth). 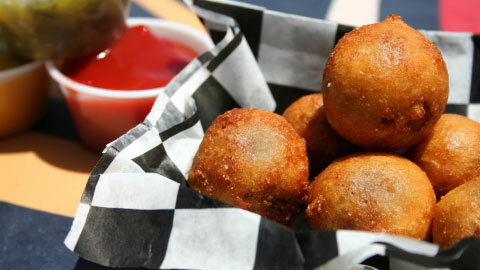 The tiny hamburgers in deep fried buns are only available for a limited time. 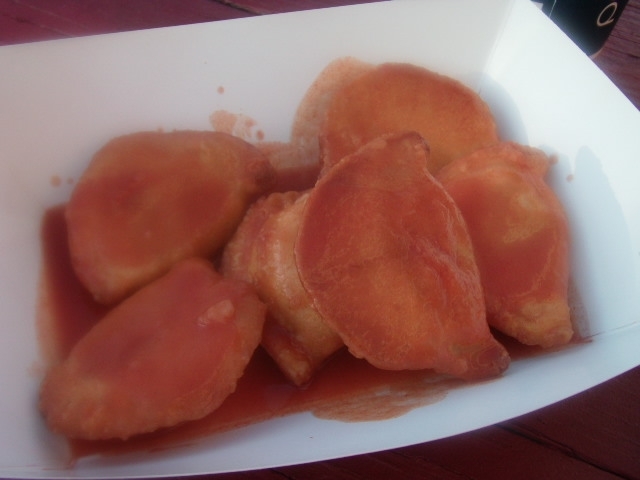 They can be upgraded to a “cheeseburger” (the addition of nacho cheese dipping sauce) and can be served with complimentary sides of ketchup, mustard and relish. 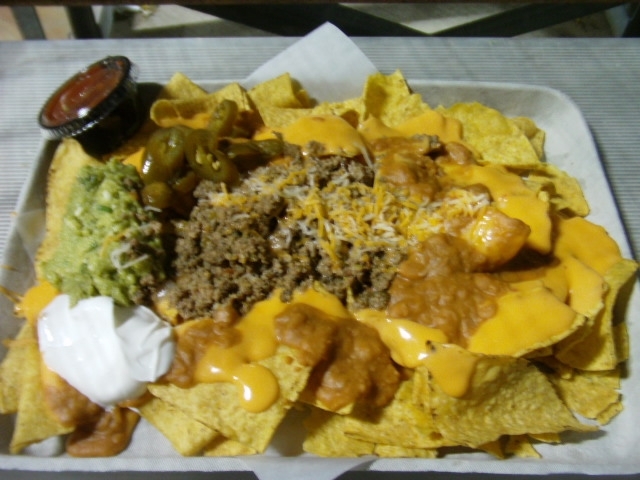 “It seemed like everyone was attempting to out-do each other this year by creating food that didn’t look appealing, so we thought we’d go in a different direction,” JetHawks Food and Beverage Director Adam Fillenworth said. This development is analogous to the rise of punk rock, a no-frills genre formed in opposition to the over-produced pomposity of ’70s arena rock bands. A particularly adept Me Decade arena-filler was Bad Company, whose hit “Feel Like Bacon Love” was certainly heard at Richmond’s The Diamond on Wednesday. 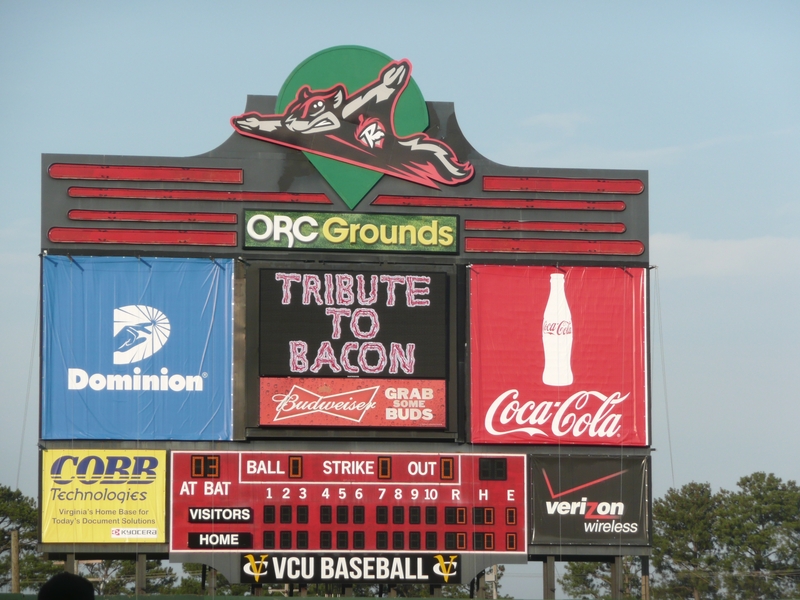 As you’ll recall, the Flying Squirrels staged a “Tribute to Bacon” featuring an appearance by a local detective with the name of Kevin Bacon. 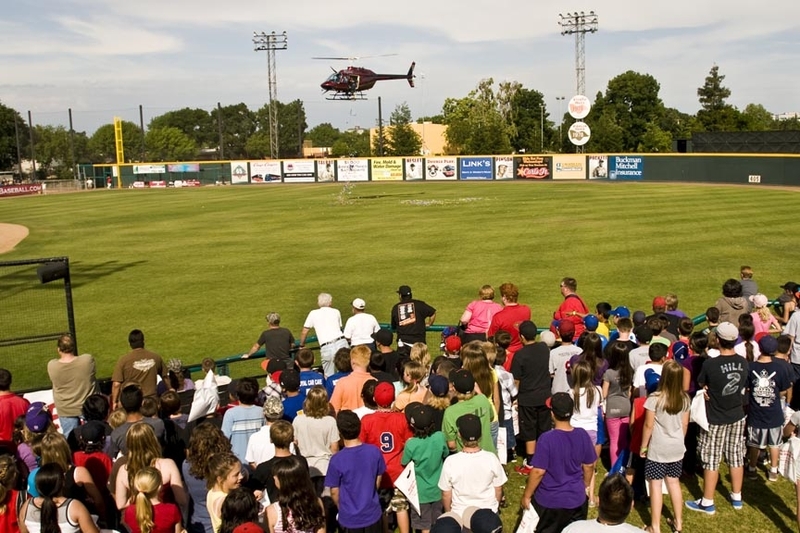 Air Guitar to "Jumpin' Jack Flash"
Sticking with the Cal League north, let’s head over to Visalia to check out this year’s Helicopter Candy Drop. 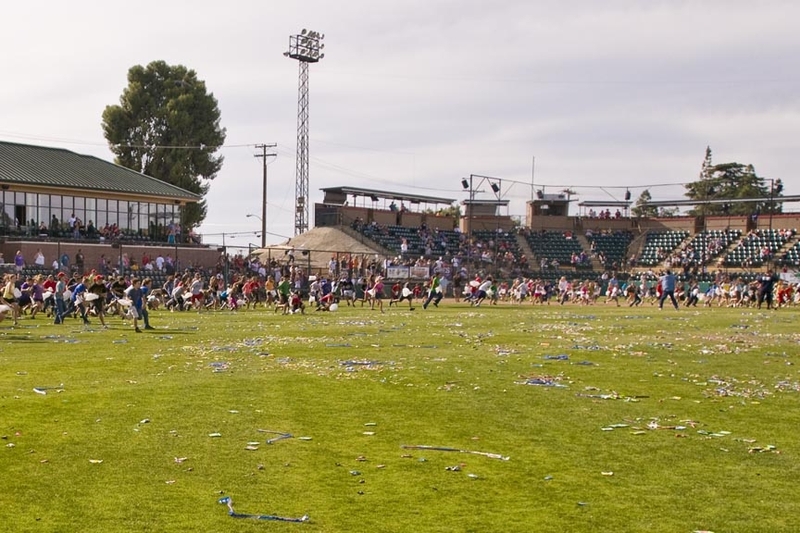 The name of the promo is truth in advertising: candy is dropped on to the field by a helicopter, and then the children in attendance go on a mad scramble. The contestants each demonstrated a talent during different half-innings; Doris, the eventual winner, led the crowd in a Rawhide cheer (“Next week I will be 96,” she said, “And I can’t believe I finally made the cheerleading team!”) Another played keyboard and sang “Take Me Out to the Ballgame.” The contestants also participated in a “White T-Shirt Contest,” where each was given a basic white Rawhide t-shirt and allowed to decorate it creatively in their own style. The contestants came from local retirement homes, where preliminary rounds where held. 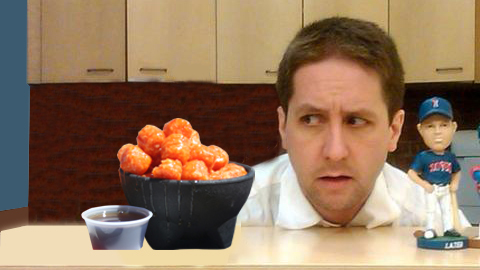 I can’t think of a better image to end the blogging week. 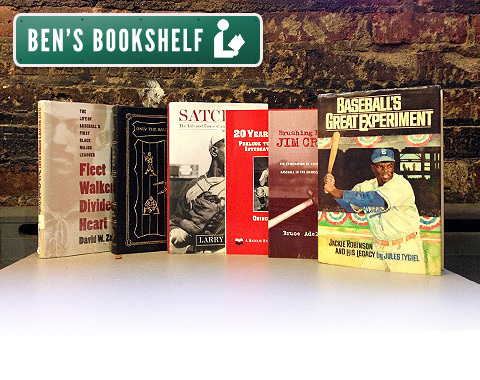 Thanks, as always, for reading. And more importantly, get in touch! It can be a difficult thing, this writing game, and your feedback and support is very much appreciated. 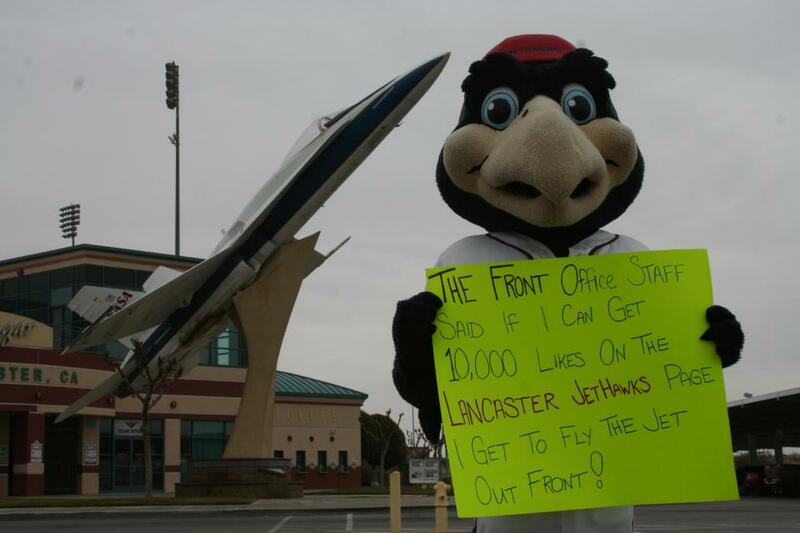 The JetHawks got their name due to the prominence of the aerospace industry in Lancaster, CA. 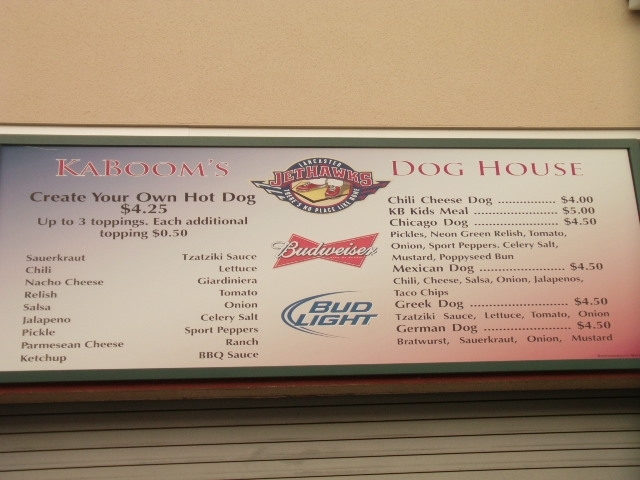 This connection is made abundantly clear immediately upon arriving at “The Hangar” (Clear Channel Stadium). 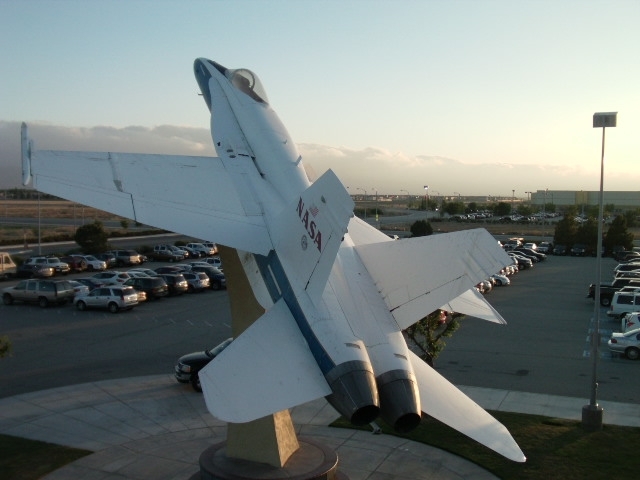 This very jet, and the stadium itself, was visible outside of my hotel room window. But what the following photo does not indicate, despite the twisted flag, is just how windy it was on Saturday evening (26 mph, blowing out to right). 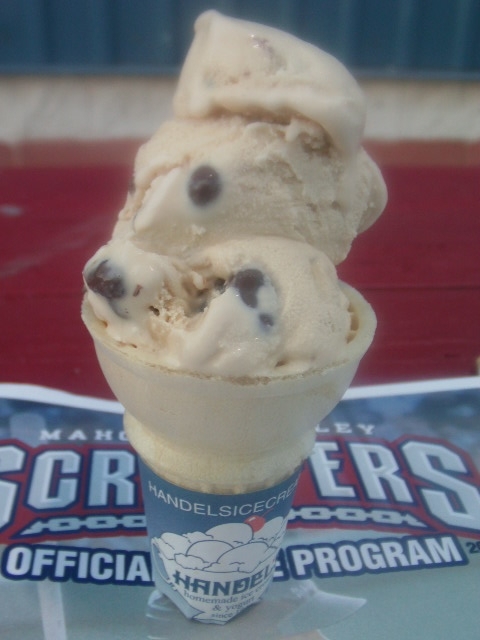 Lancaster has long had a reputation for windy conditions — the team used to have a ticket discount based on wind speed, and is giving away a “stadium dust globe” later this season — but I was nonetheless drastically under dressed for the occasion. 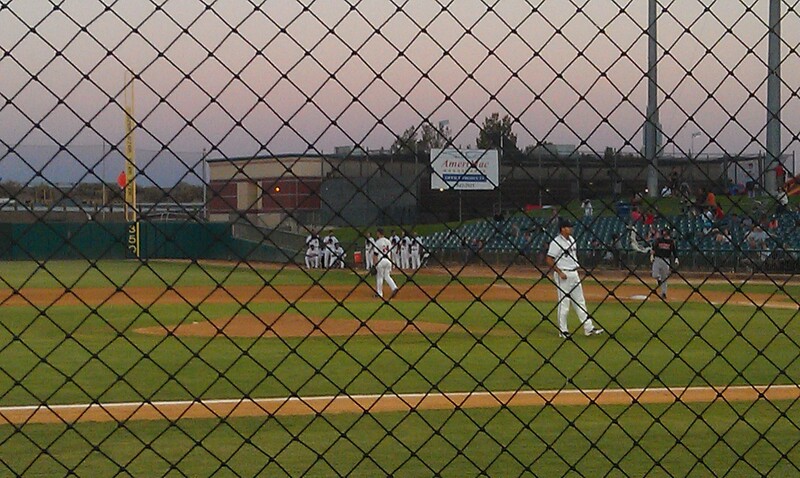 But the JetHawks’ approach is not to bemoan the elements, but to harness them. 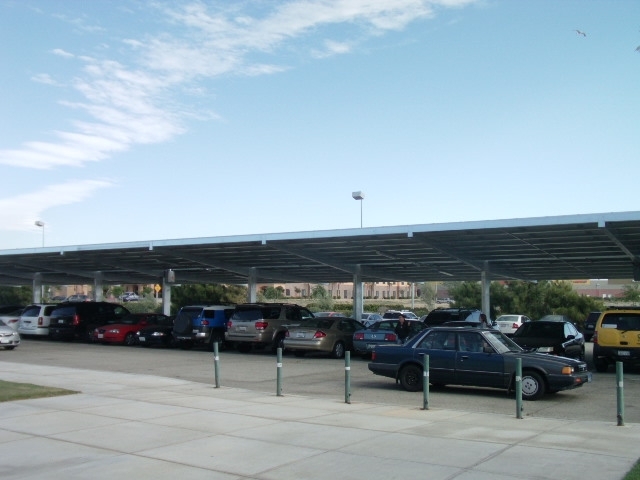 See that parking lot overhang in the above photo? 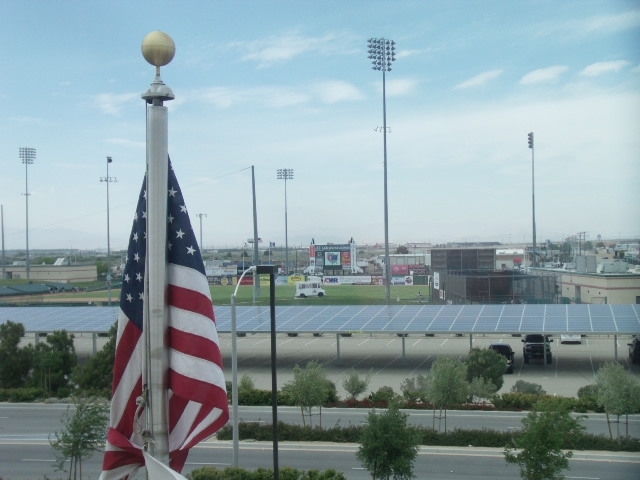 Those are solar panels, new for this season, and they provide the majority of the stadium’s energy and are expected to save upwards of $50k in energy costs. 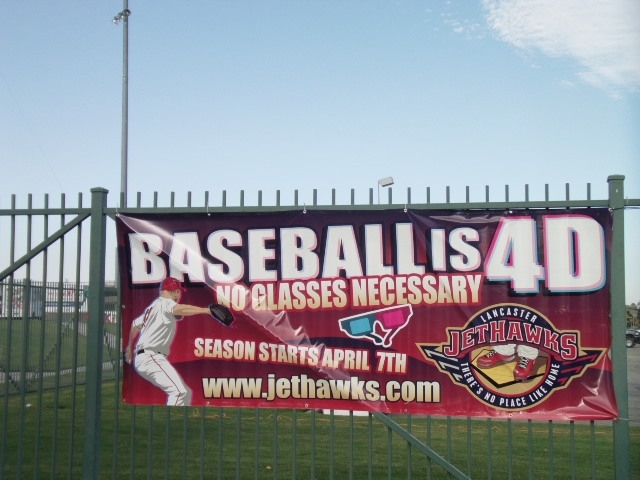 The JetHawks are the first Cal League team to do this, but I doubt they will be the last. 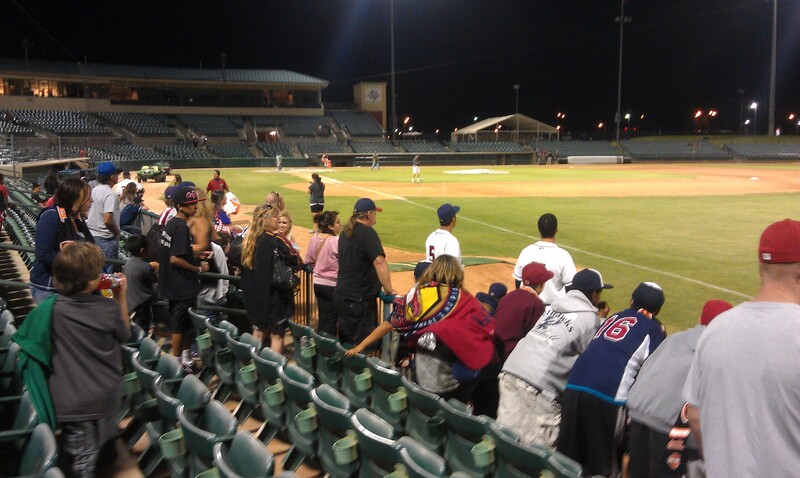 And the elements weren’t going to keep the Lancaster faithful from attending a Saturday night ballgame. Motivated in part by a camo hat giveaway, fans were lined up outside the stadium well in advance of the gates opening at 6 p.m. 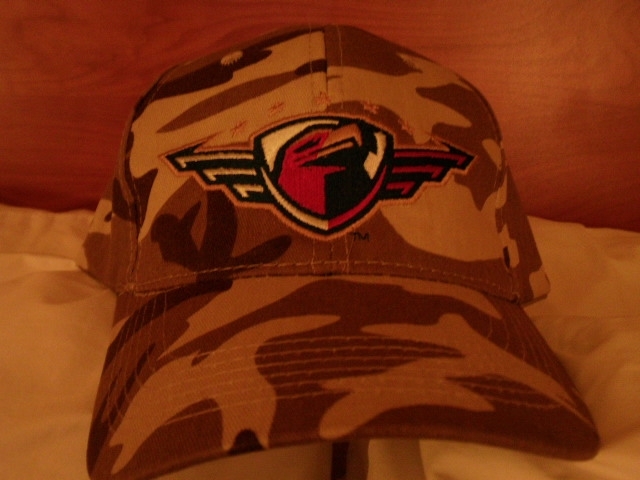 The camo hat in question, blending into its surroundings here at the Hampton Inn. The hat giveaway was sponsored by the local Desert Christian school, who were heavily involved in the overstuffed but well-orchestrated pre-game festivities. 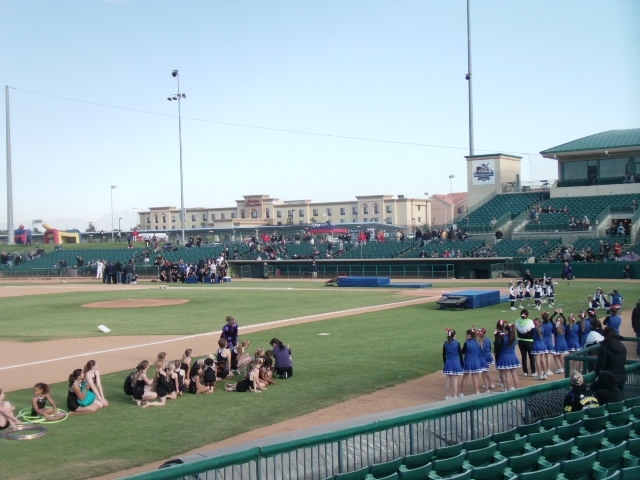 This included cheerleading routines, a gymnastic performance (with the gymnasts shivering in the gusty 59 degree weather) and a marching band. The “Hawkettes Dance Team” often provide top-of-dugout entertainment. 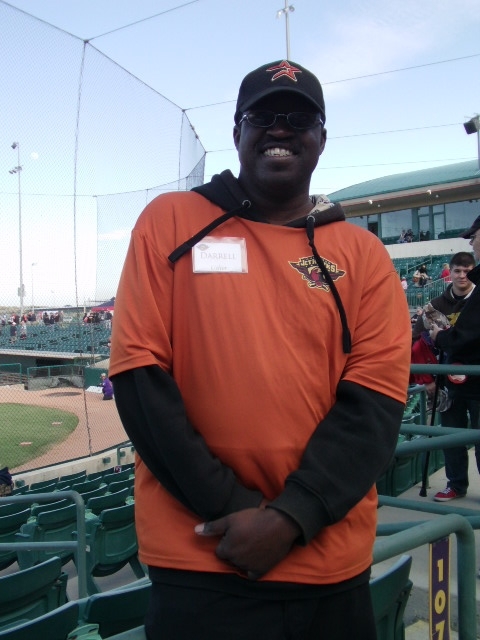 Another prominent mover and shaker in the JetHawks universe is “Dancin’ Darrell,” an usher immortalized with his own “Hangar Hero” bobblehead last season. While I missed Darrell’s performance on Saturday, I did get a chance to speak with him and snap the above photo. 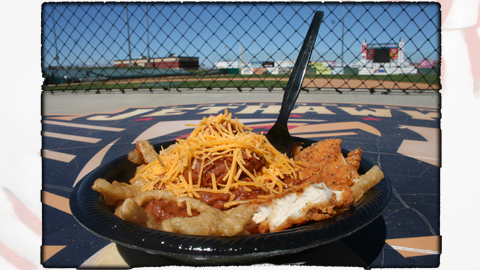 He and other aspects of the JetHawks experience will be incorporated into an upcoming MiLB.com piece dealing with my Cal League meanderings (Make like a Chattanooga mountain climber and be on the Lookout). Another individual I spoke with (prior to the game) was second baseman Jose Altuve. 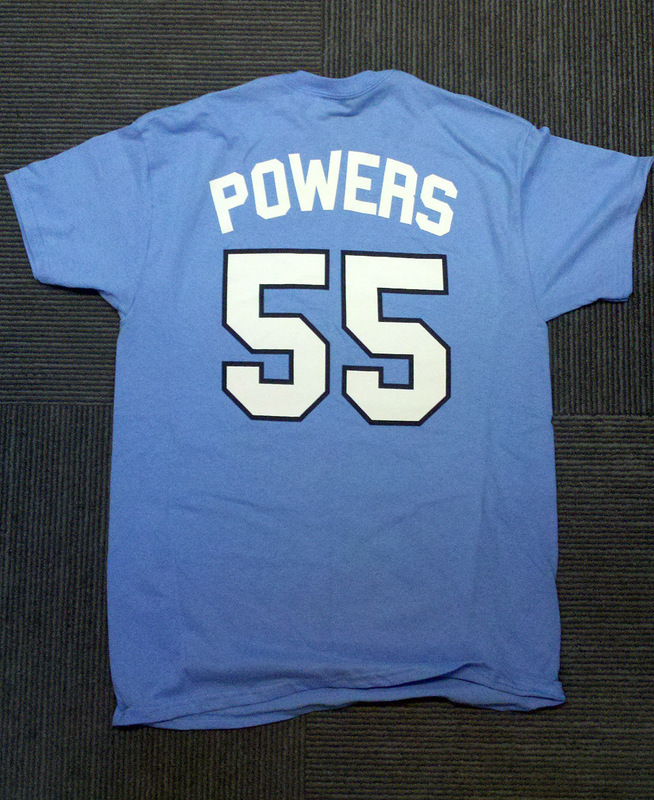 He’s 5’5″, very friendly, very fast, and an excellent hitter. 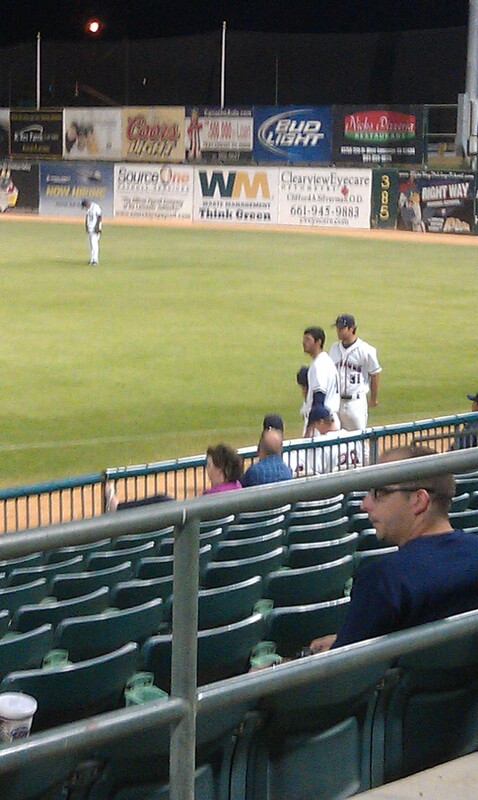 In other words, one of my new favorite Minor Leaguers. 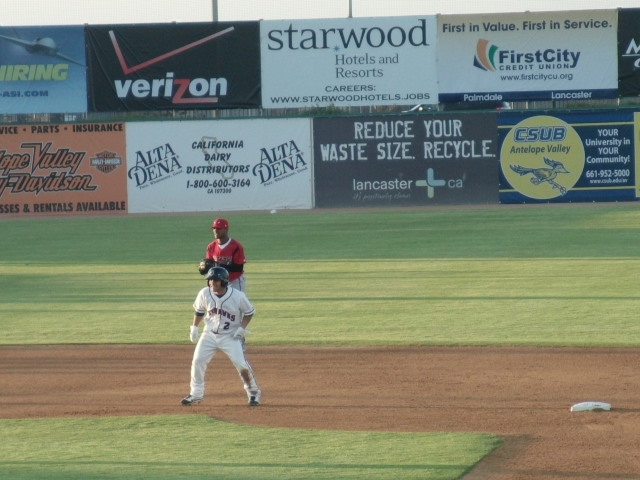 Here he is in the first inning after legging out a double (look for video interviews with Altuve, closer Kirk Clark and slugger Kody Hinze on MiLB.com). Moving from Altuve to “A tooth, eh?”, you’ll notice the following bit of dental-themed advertising. If a player hits it during a game he receives a free teeth whitening. 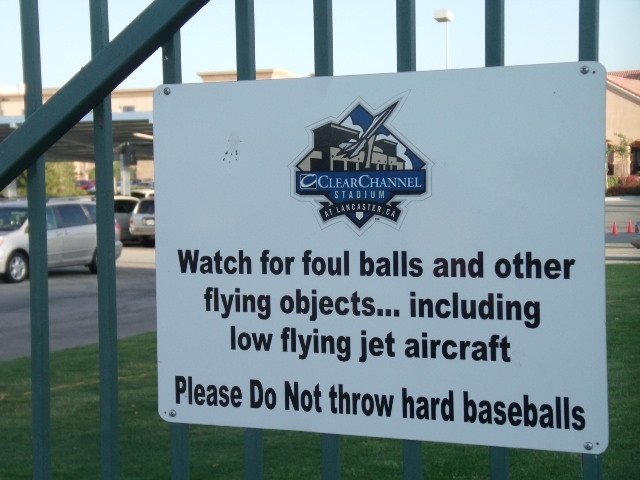 Interesting signage abounds at Clear Channel, in fact. This complementary caption is not to compliment, but to point out that "compliment" should be "complement." One thing I’ve learned through my job is that Minor League Baseball teams consider movie theaters to be mortal enemies in their holy war for the almighty family entertainment dollar. 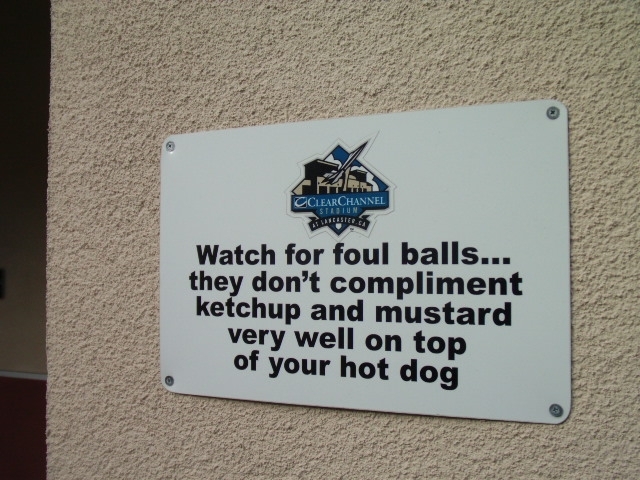 This sign makes the animosity explicit. Take that movie theater located directly across from the stadium! 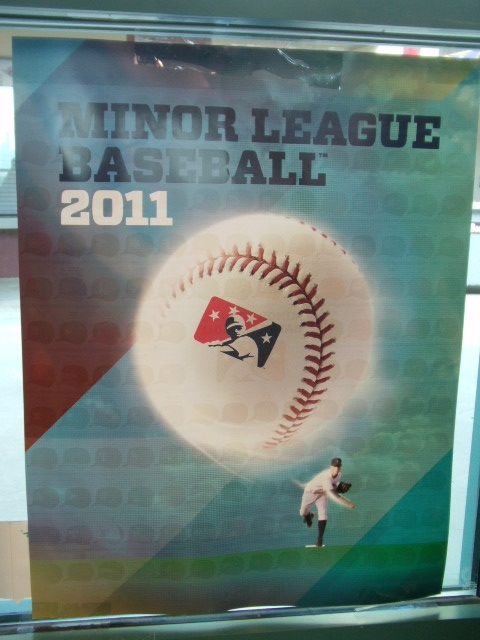 This poster was hanging in the JetHawks front office. I want it! 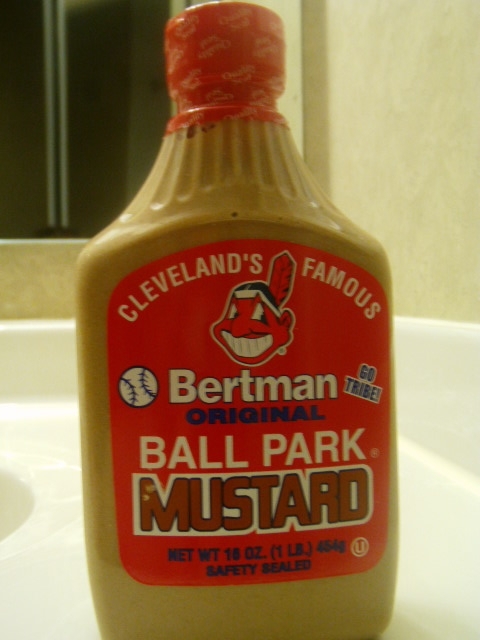 And this, which I also want, was hanging in the team store. 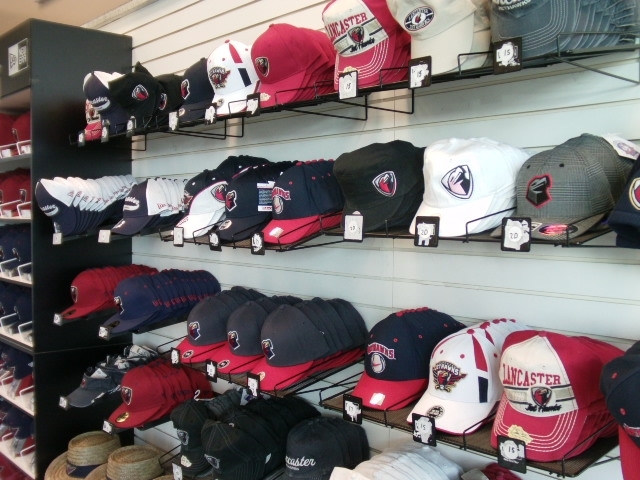 And speaking of said store, they had a most impressive hat collection (you know, in case complimentary camo’s not your thing. Or, if you want to complement your complimentary camo). 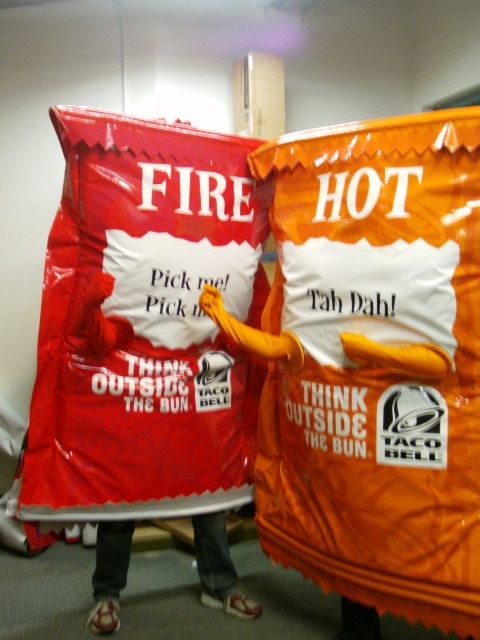 Of course, it wouldn’t be a Minor League road trip if I wasn’t able to add to my list of “hallucinogenic-worthy things I have dressed up and raced as.” Add Taco Bell Fire Sauce Packet to the overall tally, please. I raced against “Hot” (one of the Hawkettes, natch) and mascot Kaboom (who I somehow didn’t get a picture of tonight). 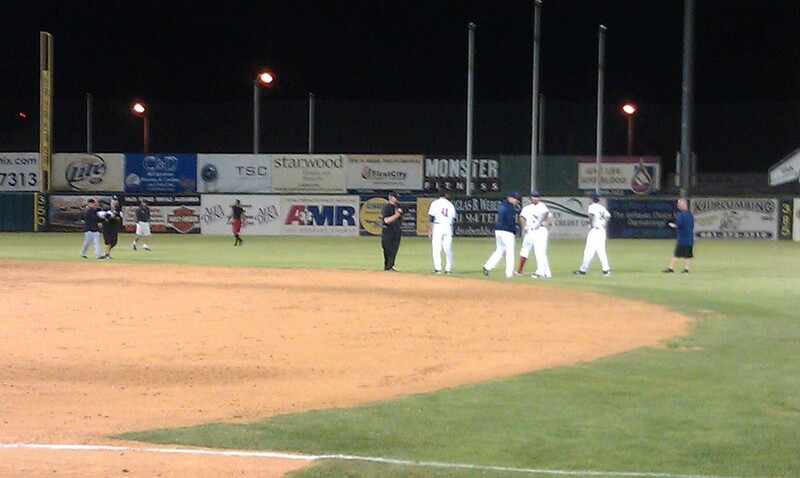 Kaboom and I lost, after deciding to pose for a picture on field. 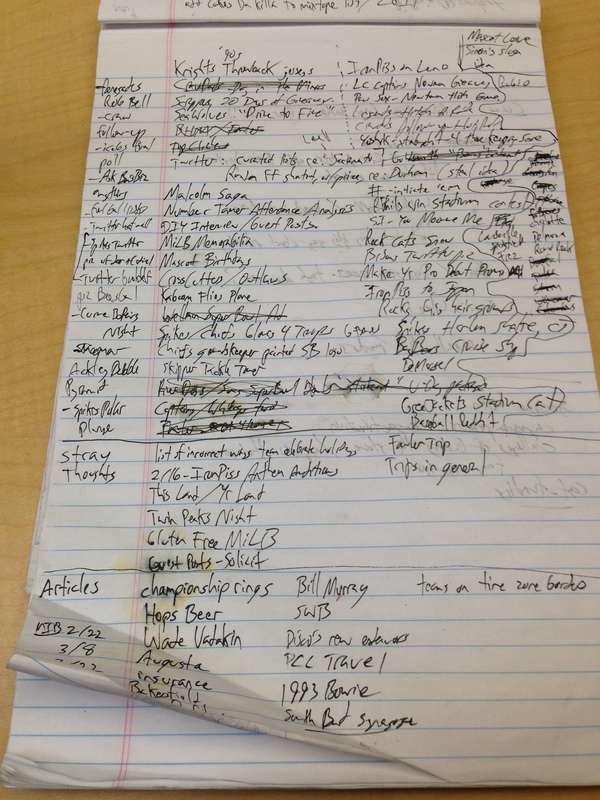 Video of all this exists — look for it on this blog shortly and if you don’t see it, then demand it. I am responsive to your needs, so long as they are also mine. 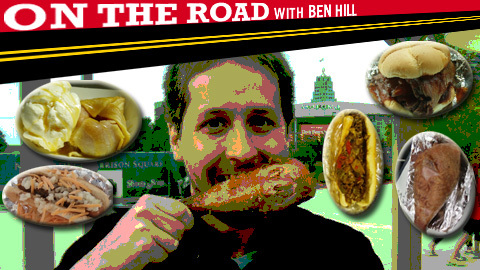 Of course, racing as the human embodiment of a mass-produced condiment really works up the appetite. 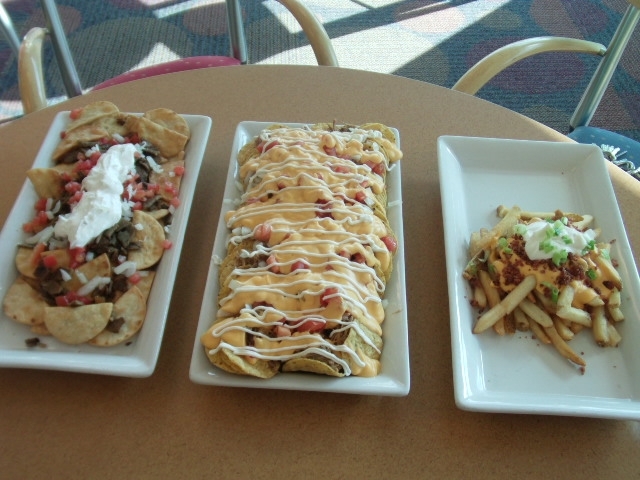 Fortunately, there are plenty of options (at least if you’re a carnivore). 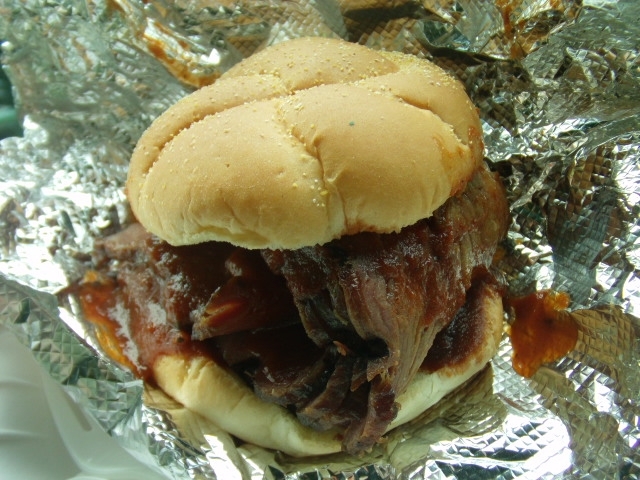 And there are plenty of carnivores among the fanbase. 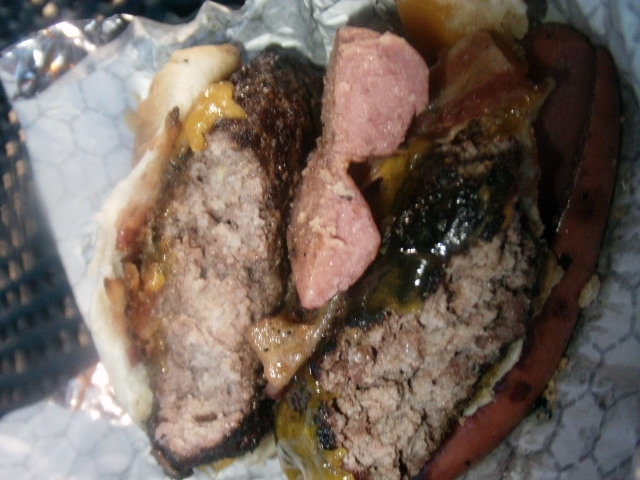 The Stealth Burger (which is about as stealth as a radioactive elephant on jet-powered rollerskates) tasted fine, but it was difficult for me to combine the different flavors. 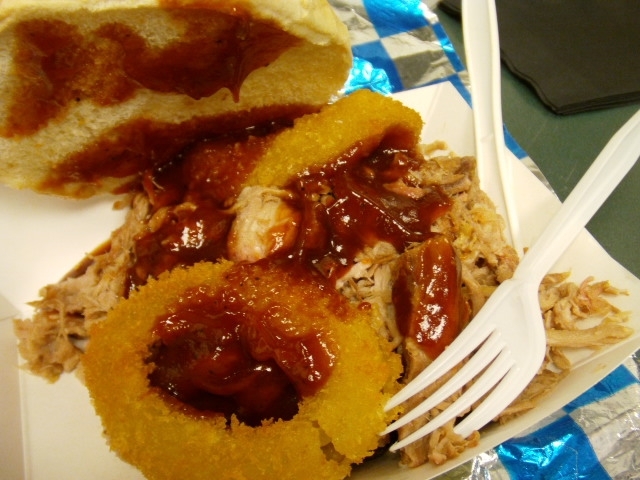 Ultimately, it made me realize that I enjoy pulled pork significantly more than I do hamburger. 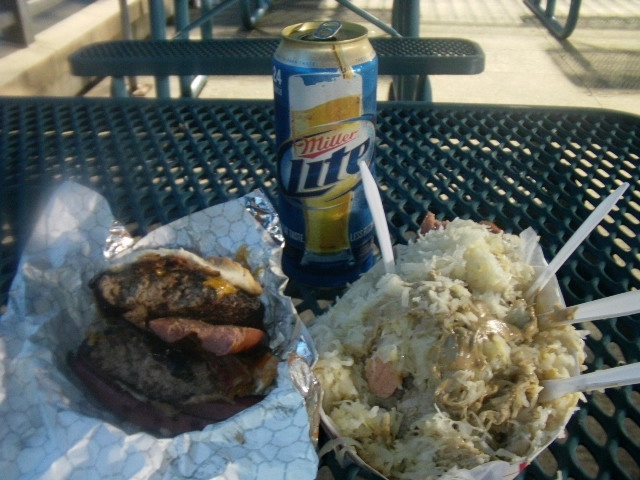 And speaking of hamburger, I was speaking with JetHawks food and beverage director Adam Fillenworth during the game and he mentioned that the JetHawks will soon debut “the smallest hamburger in Minor League Baseball” (the “anti-monster burger” if you will). Any ideas on what to name it? He’s open to suggestions. 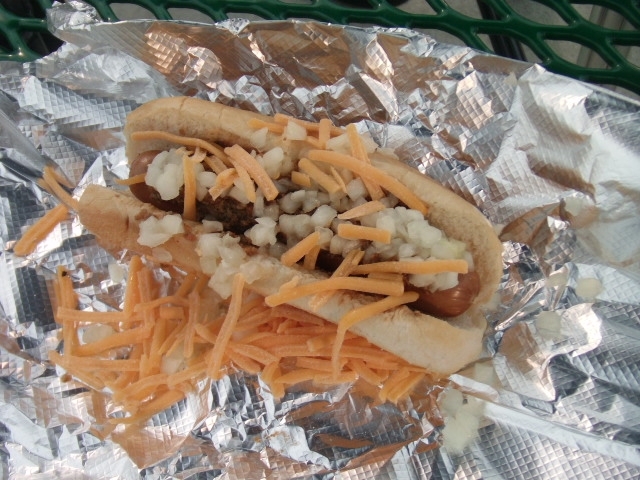 At any rate, I enjoyed these creative concessions of colossal caloric content while ensconced in the Clear Channel control console, ably manned by PA announcer J.T. and his crew. Watching these guys in action really fosters an appreciation for just how much is going on at any given moment — sound effects, scoreboard updates, at-bat songs, between-inning contests, ad reads, etc. It’s a ton of work — involving constant communication both in the booth and via walkie-talkie — but everyone involved seemed to be enjoying themselves. 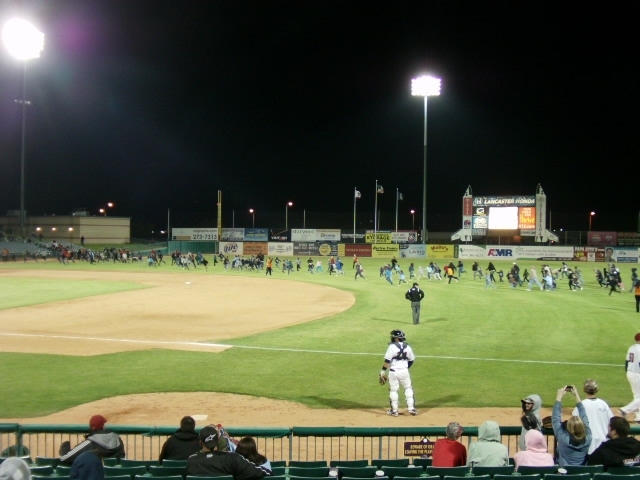 I made it back down to the seating bowl in time to capture an seemingly endless stream of kids chase Kaboom through the outfield (Kaboom not pictured, of course). But no matter how long a game takes to play, it will always end with hula hoops and tennis balls strewn across the field. That’s how you know when to call it a night. So, I’m calling it a night. 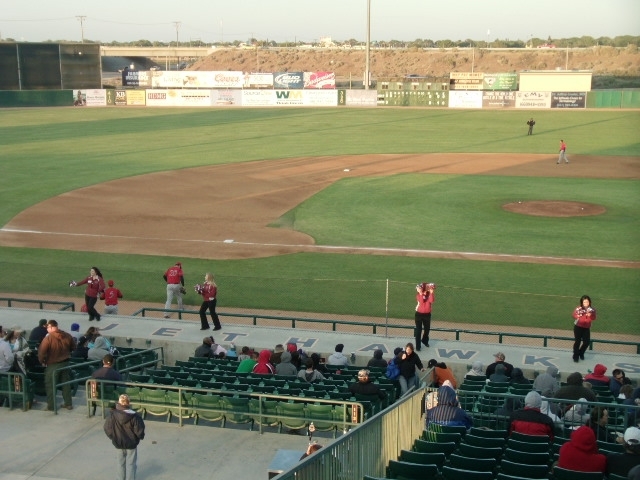 Thanks to the JetHawks for their hospitality (especially uber-helpful media relations manager Will Thornhill). I hope I’ve been able to convey that Clear Channel is a worthwhile place to visit, resulting in the most positive association one could possibly make with corporate radio hegemony.